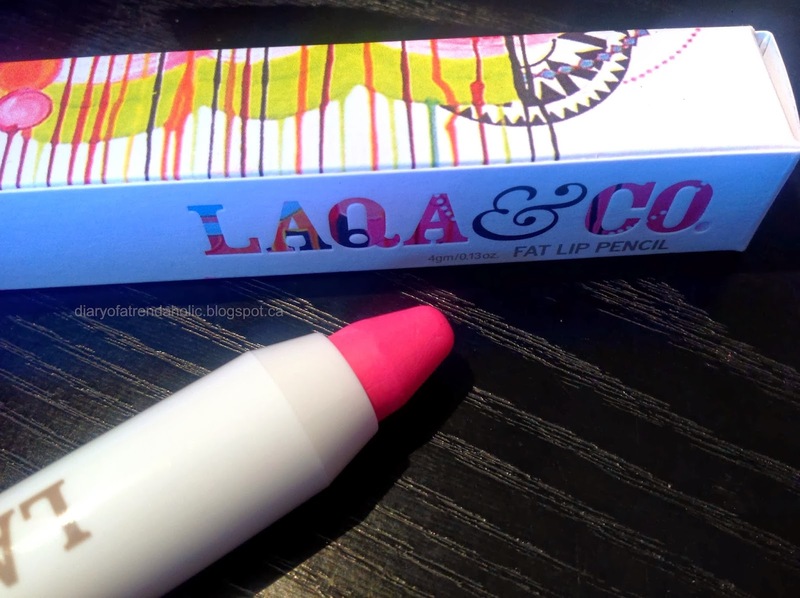 Laqa & Co is a beauty company that sells nail polish and cute jumbo lip pencils. I have seen their products popping up in various beauty boxes and I have wanted to review their line for some time. The company also supports and works with artists from all over the world to create aesthetically creative packaging in fun designs. 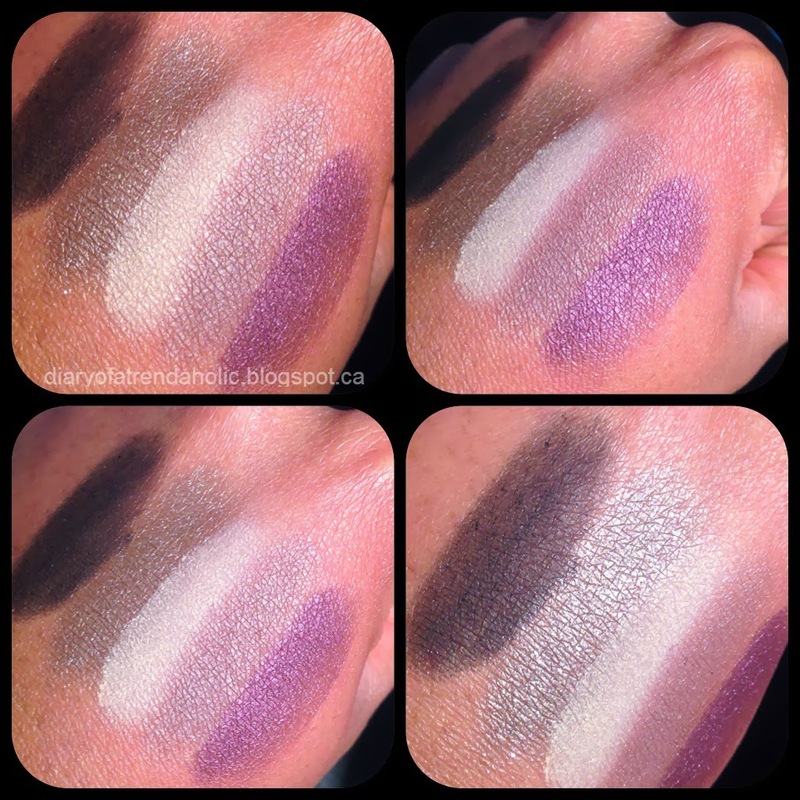 Today I am going to review a few popular items in some pretty shades. 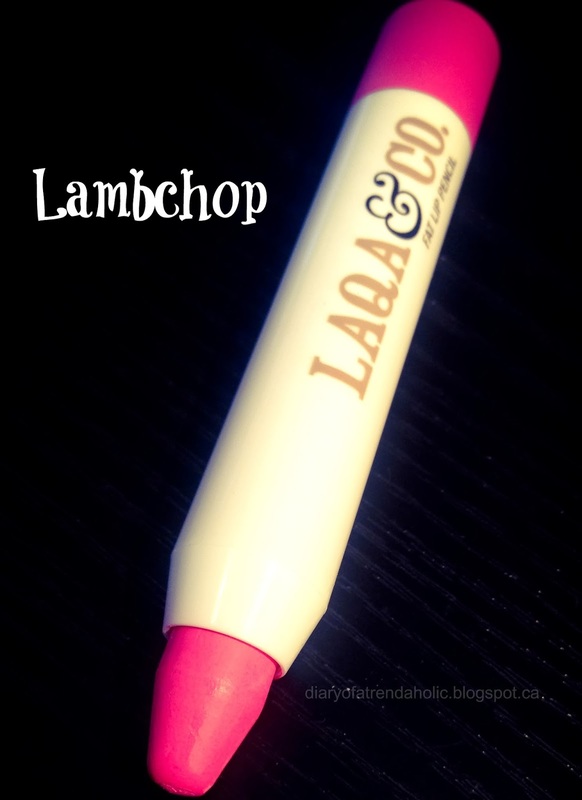 I received this large lip pencil in a vibrant bubble gum pink called Lambchop. What I like about this pencil is that it does not need to be sharpened, it twists up for easy application and there is a lot of product per tube. With lip pencils I am usually a bit weary of how vibrant the color will actually show up but this pencil has good pigmentation. 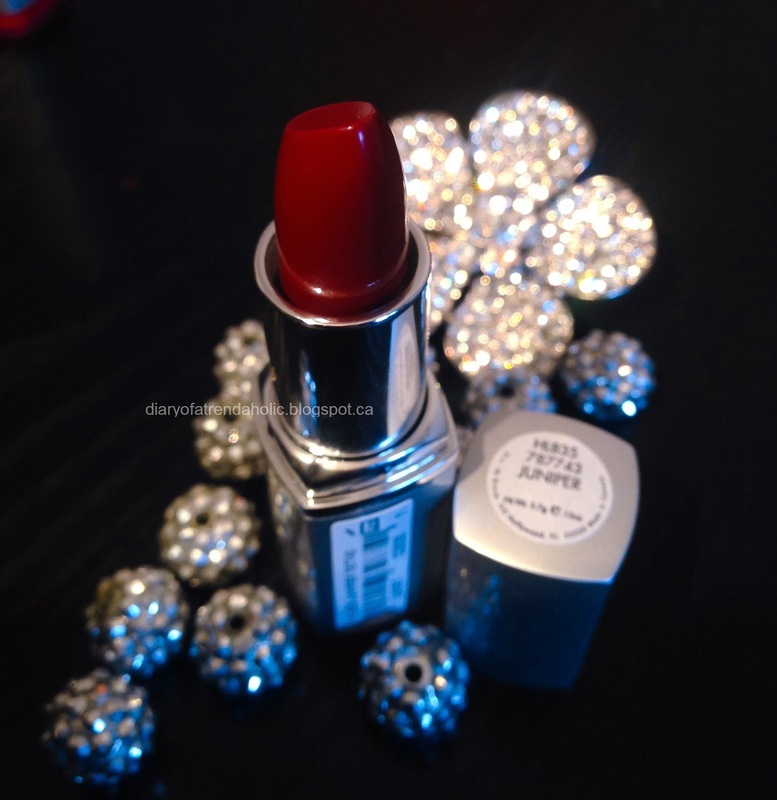 It provides the saturation of a lipstick with adequate hydration and the color is quite buildable. 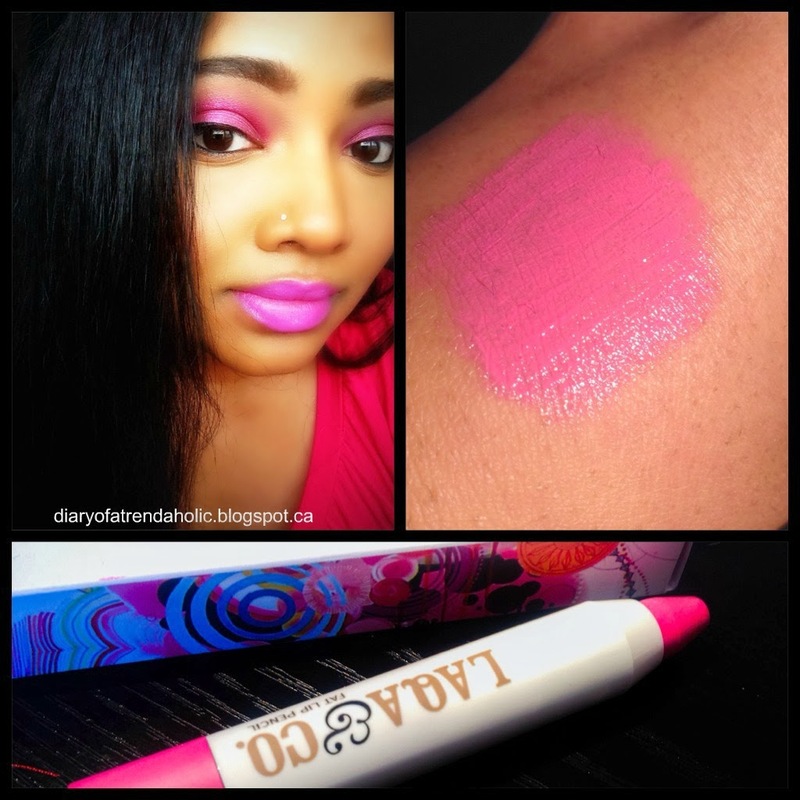 The texture is slightly creamy although I did find that the pencil works best on smooth lips. On chapped lips it tends to settle into the cracks and accentuate them. It also has a slightly minty scent which doesn't last or tingle. The shape of the pencil makes touch-ups convenient while on the go. I love nail polish but I will admit to being a bit lazy when it comes to refreshing my manicure and practicing with nail art tools. This pen is great for people like me because I can take it with me on the go and paint my nails anywhere. It is easy to toss in a bag without worrying about spills and comes in appealing packaging. When I first saw the long pointed brush I was a bit concerned with how easy it would be to use but I was pleasantly surprised. 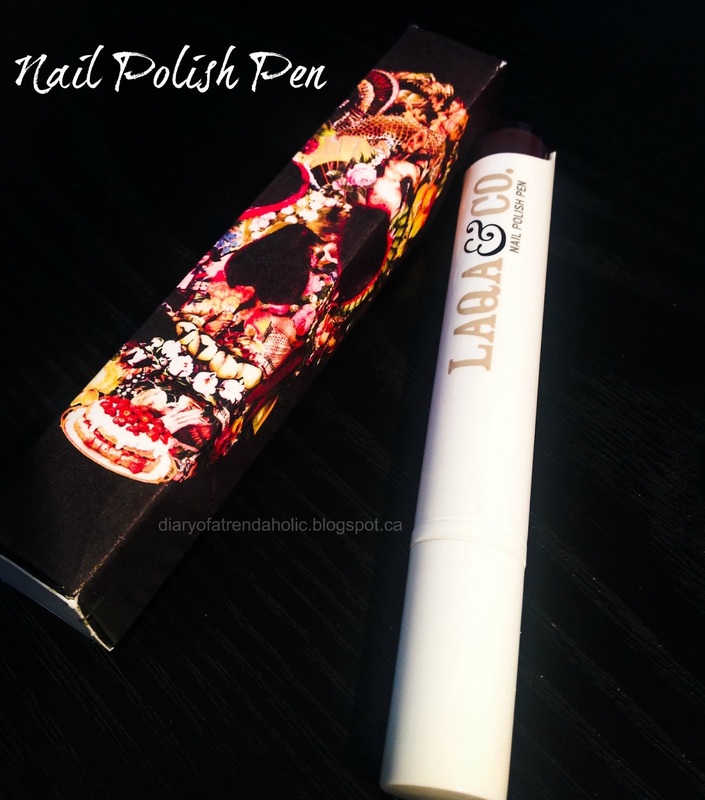 All you do is push down on the top of the pen and nail polish dispenses onto the brush. The size of the brush makes it easy to apply the polish but you do have to be careful because there isn't much control over how much comes out. One click may be enough to paint more than one nail. The brush is rather pliable and gets close to the the cuticle and corners which makes it easier to be neat. I found that using light pressure is best as the bristles can splay apart at the end. The brush can become a bit misshapen so I recommend smoothing the bristles back into their original shape after each use to prevent a frayed appearance. The polish has a high gloss finish which I like and dries quite fast. After painting my nails there was polish left over on the brush so wiping off the excess may be necessary before replacing the cap. Overall application is quite tidy if you are careful, however I still prefer the traditional nail polish bottles to the pen. 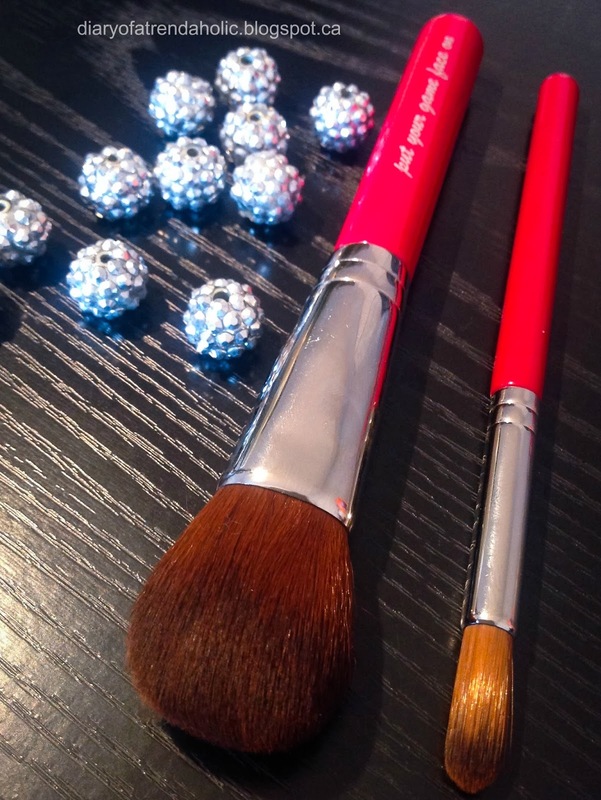 I also noticed that since the brush is not stored inside the nail polish itself the bristles become stiff when dry. In this photo I am wearing both Plonk (a dark plum) and Chubs which is reviewed below. 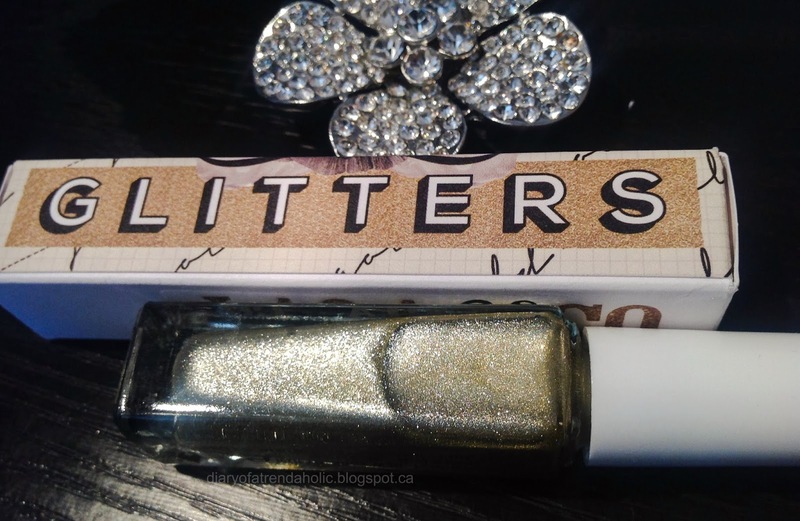 This nail polish is a gorgeous sparkly silver-gold with fine, densely packed glitter fragments and an opaque finish. I like the shape of the bottle and this color looks great as a main color or as an accent nail. 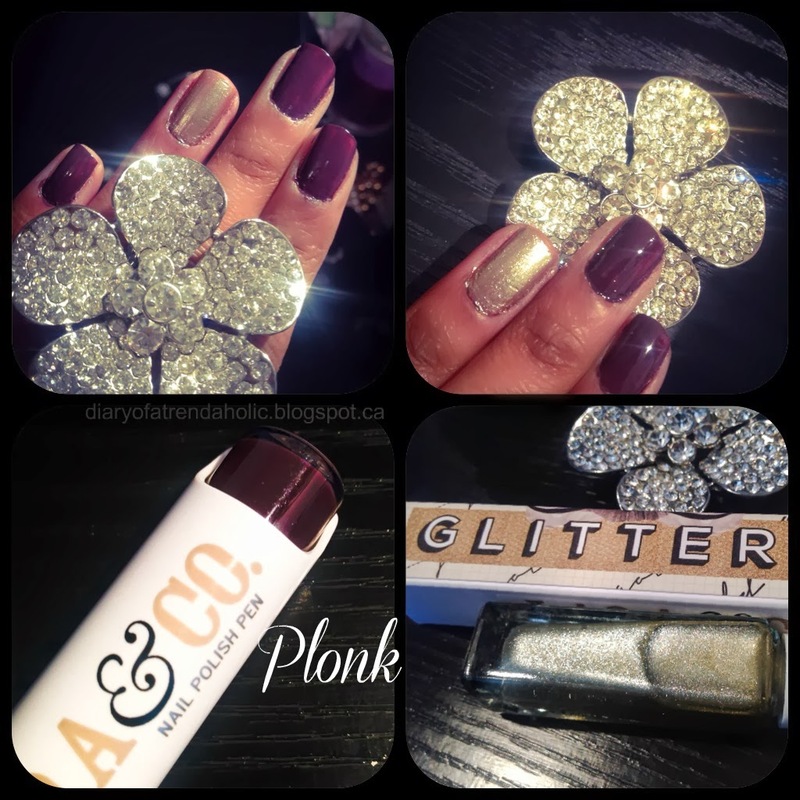 It dries quickly and is easy to apply, I only needed one coat! 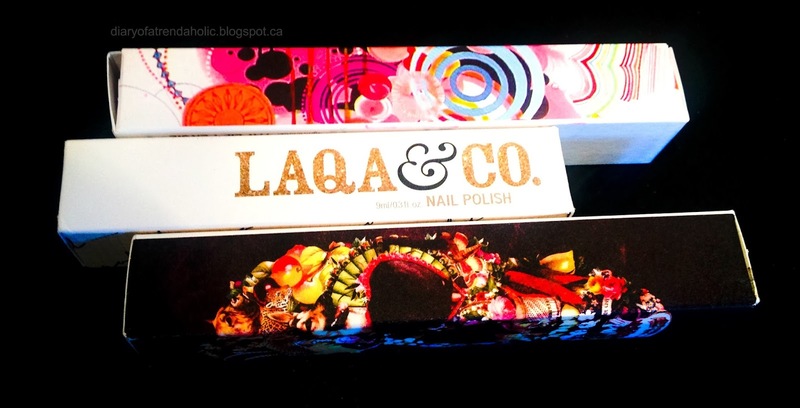 Laqa & Co nail polishes come in a variety of beautiful colors and retail for $11 each. You can find more information HERE. They also have a Color of the Month Club which is a nail polish subscription for $12 per month. 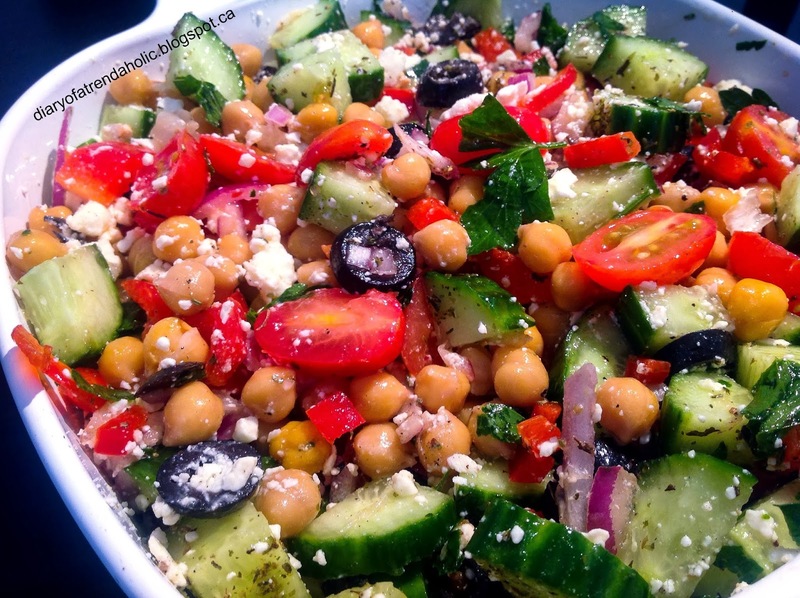 I love a healthy salad as an appetizer or entree so as I was scrolling through the countless delectable looking photos in my Pinterest salad board I came across this hearty dish. 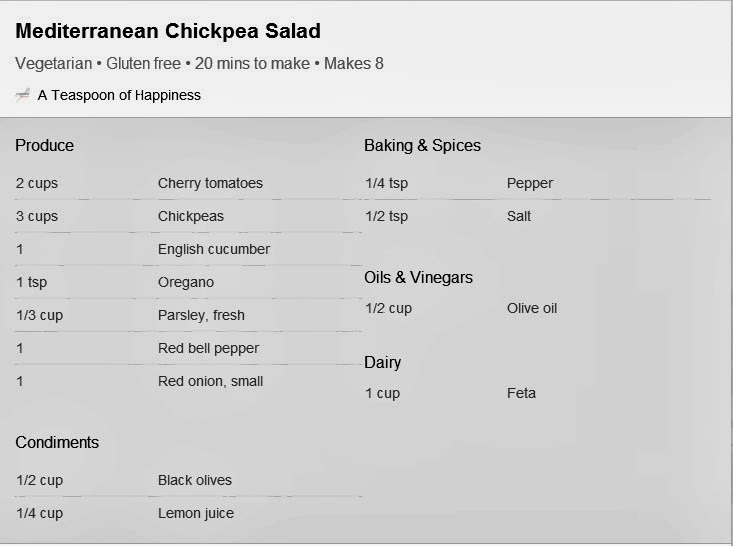 Mediterranean cuisine is one of my favorites and since I always have some chick peas lying around I decided to make this deliciously filling salad for dinner. It also gave me a chance to actually try out another recipe from the hundreds I have pinned. 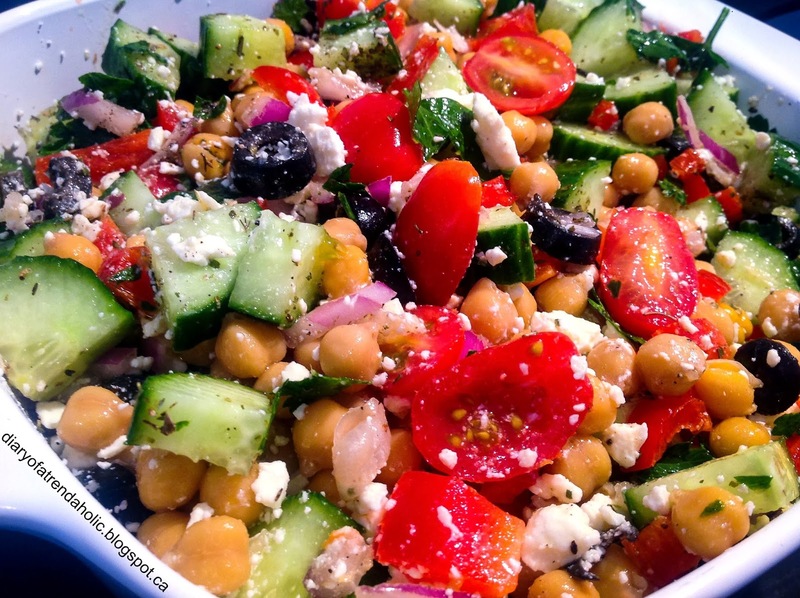 I did alter the recipe slightly by opting for light feta cheese instead and adding a touch of balsamic vinaigrette. It was simple, fresh and enjoyable. Real Purity is a brand that focuses on quality ingredients and cruelty free makeup that is safe, non-irritating and environmentally friendly. It is a family owned beauty company that sells everything from bath items, cosmetics and skin care products. 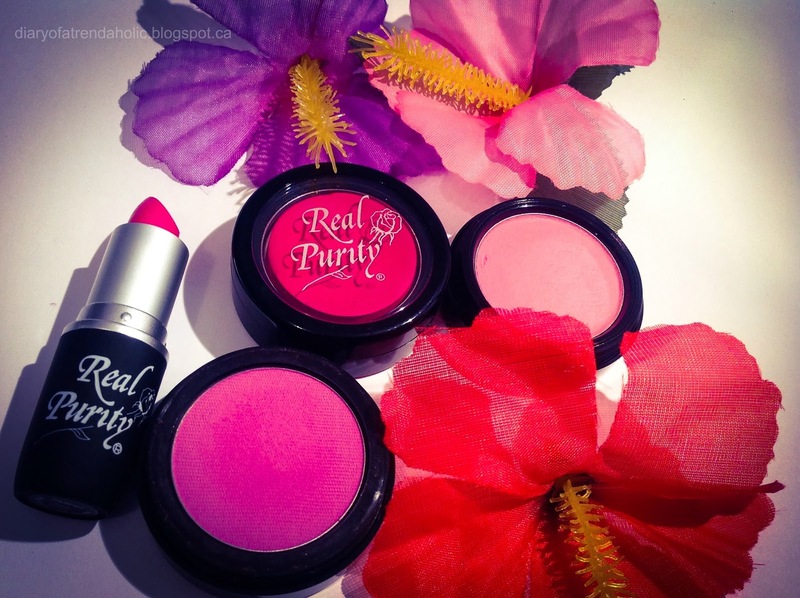 Today I have a review on makeup by Real Purity in some beautiful shades. I have been trying these items for weeks now and I am really enjoying them. 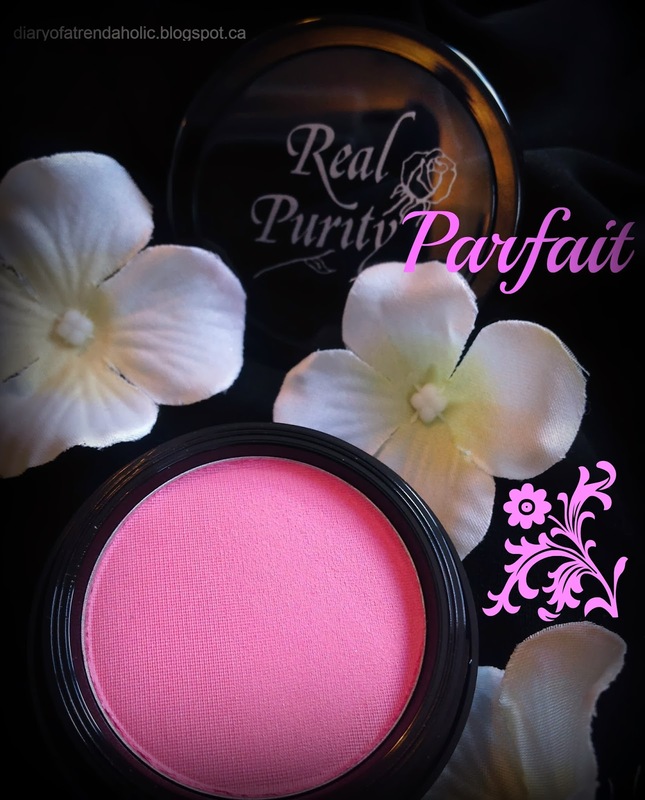 Real Purity sells a great selection of blushes in some pretty colors but one that caught my attention right away was Frosted Orchid. 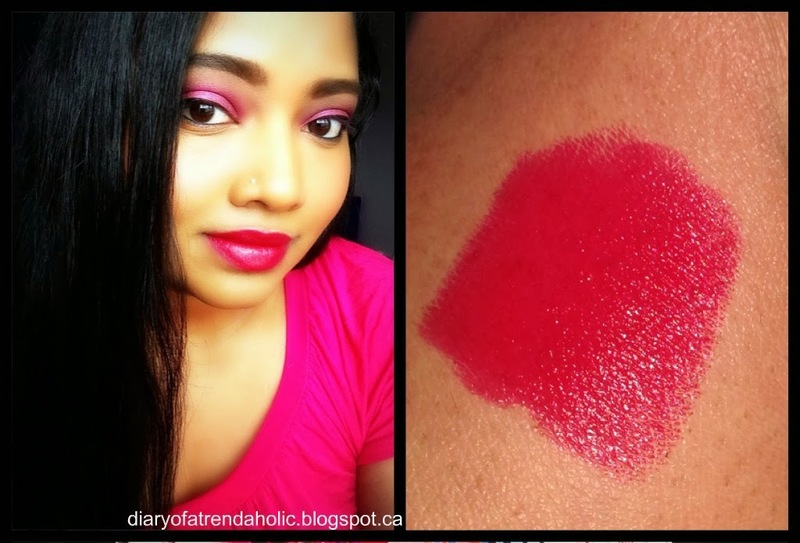 This blush is a purple-pink shade and since I didn't have anything quite like it in my collection I had to try it. 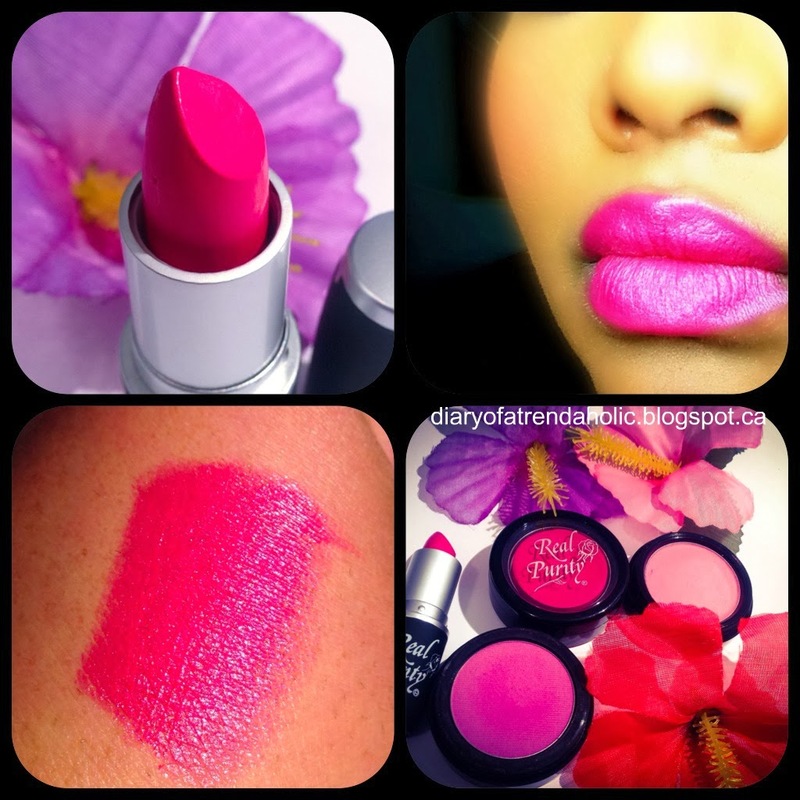 On the website the blush appears to be very purple but it is actually more pink; nevertheless it is a beautiful shade. On the skin it shows up as a deep berry color which is very appealing. 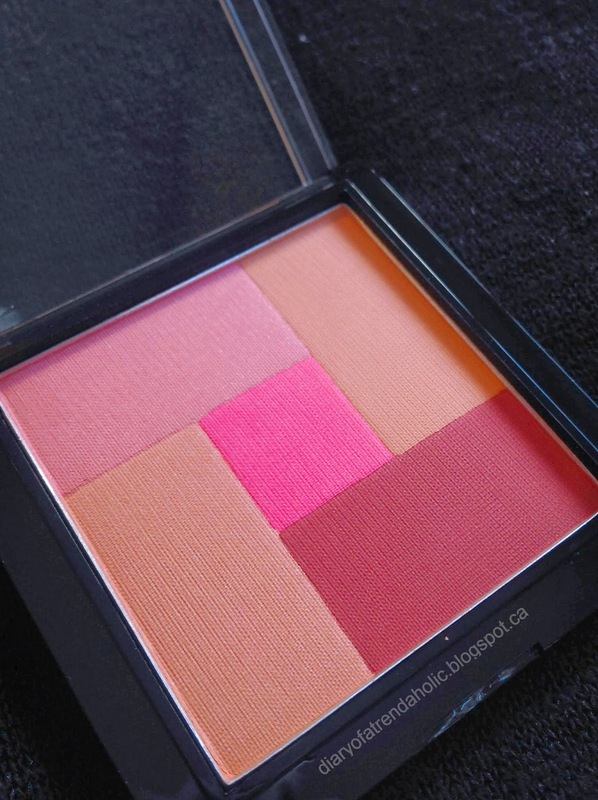 The blush is smooth and buildable. 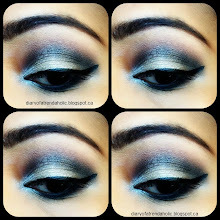 You can create soft or bold looks and applying less or more produces a totally different appearance and effect. The formula is non-chalky and contains no shimmer whatsoever so you get pure color without any silver based highlight on top. This shade is suitable for both cool and warm skin tones. The packaging is very simple and goes with the theme of the brand. The blush retails for $15 for the full size (20 oz) and samples are available so you can test colors to determine what works best for you. Parfait is a light, subtle pink that highlights the face without sparkle. On the website this pink is described as “bubble gum pink” but it does not give off any harsh tones, just pretty accentuating color that shows up slightly frosted. It is best suited for “cool skin tones” although on warm tones it works well to brighten the face. This is a lovely pink for spring. I like to go subtle and soft but sometimes I want something a bit more fun and vibrant. 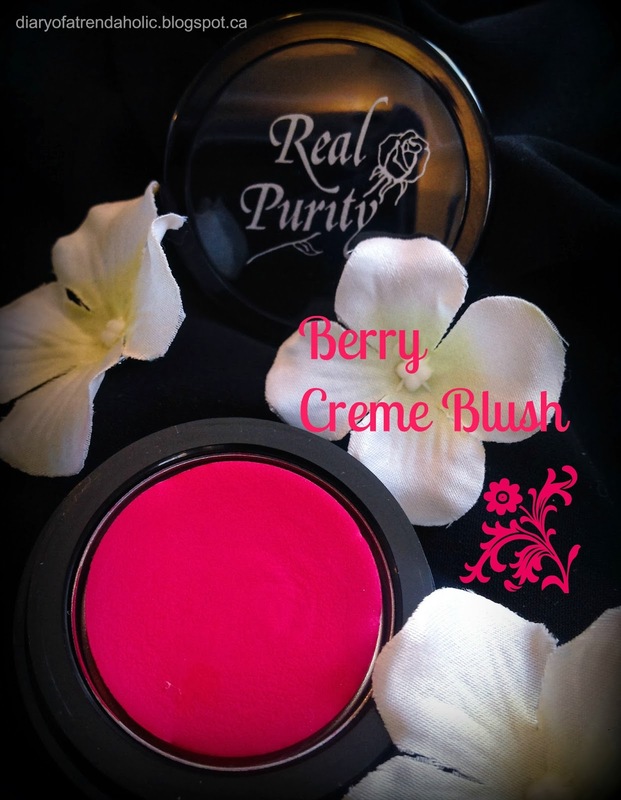 This crème blush in the color Berry is a rich raspberry shade that is ultra creamy! 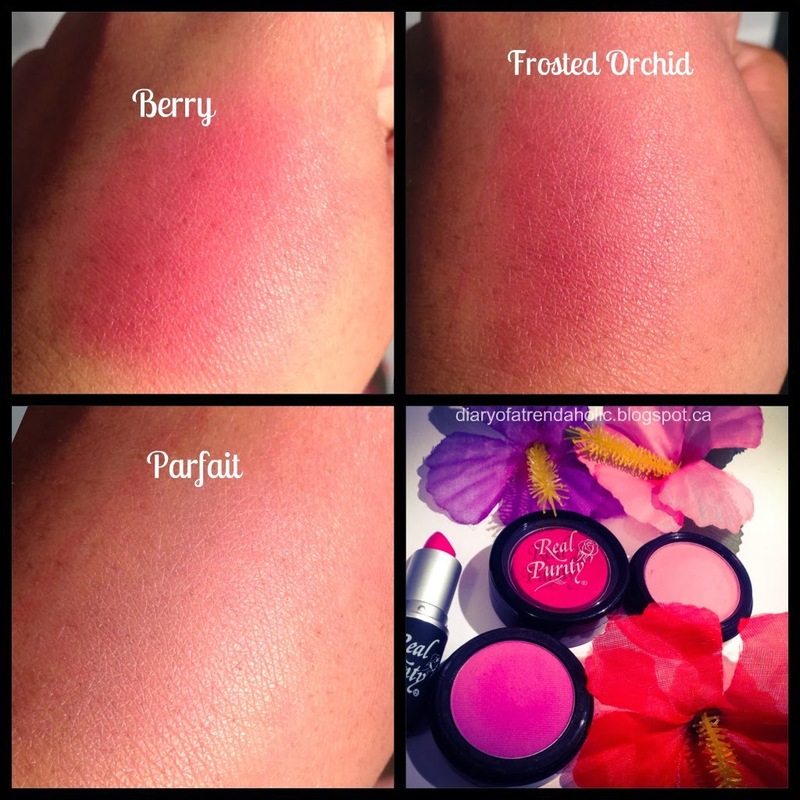 My favorite way to apply cream blush is simply using my fingertips, I pat the blush on and blend it out where I want it to sit. The texture of this blush slides on so smooth that it would have been a great idea to make it into a multi-purpose product for use on the lips as well. 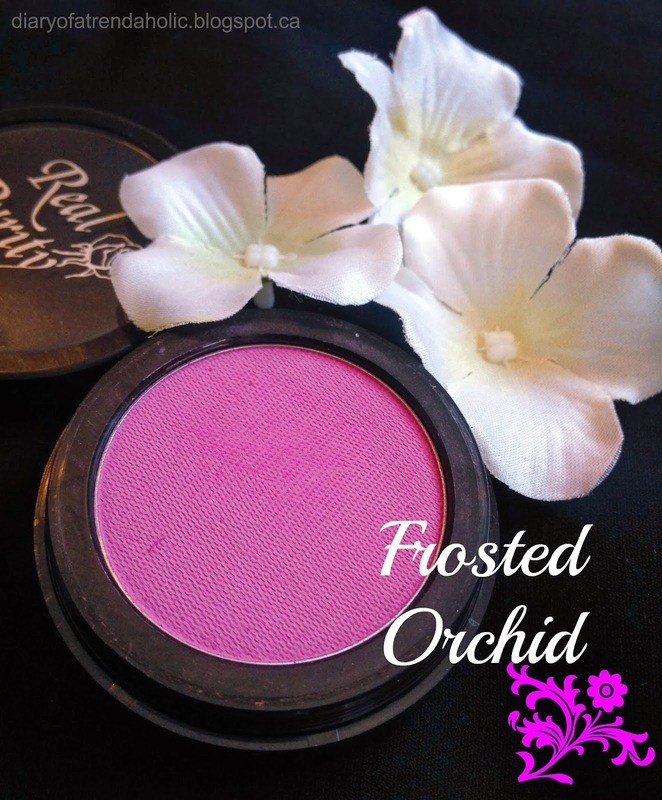 The blush contains sunflower oil, jojoba seed oil and vanilla and grape extract. Although the shade may look a bit daunting to some you don’t have to cake it on! Don’t let the color intimidate; a little dab onto the apples of the cheeks gives gorgeous, healthy color to the face. I heavily swatched these blushes to demonstrate just how pigmented they can get but on the face you would use them a lot more sparingly! 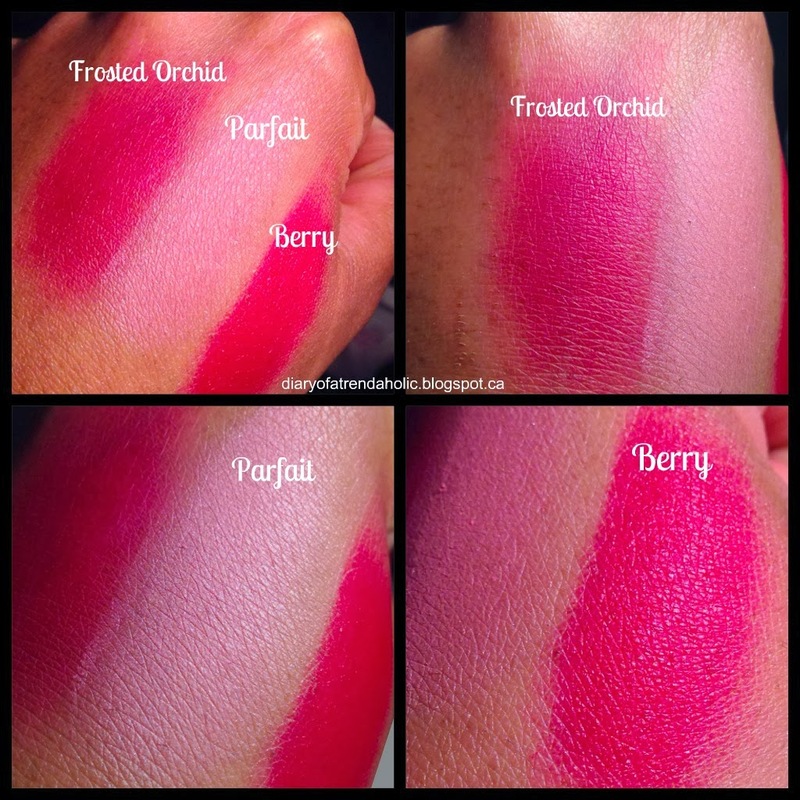 I also swatched the blushes lightly to demonstrate how subtle and soft they can appear. As you can see from the two sets of swatches these blushes are very buildable and provide a nice range of saturation to work with. 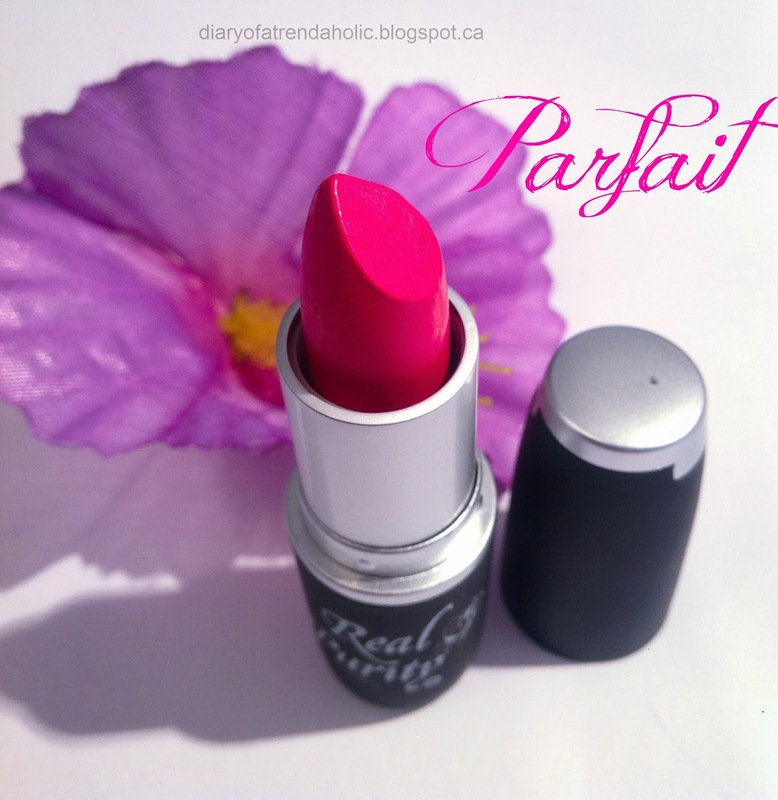 Infused with castor oil, aloe and sweet almond oil this lipstick is creamy, smooth and highly pigmented.The pink is intense and bright making it ideal for spring and summer. 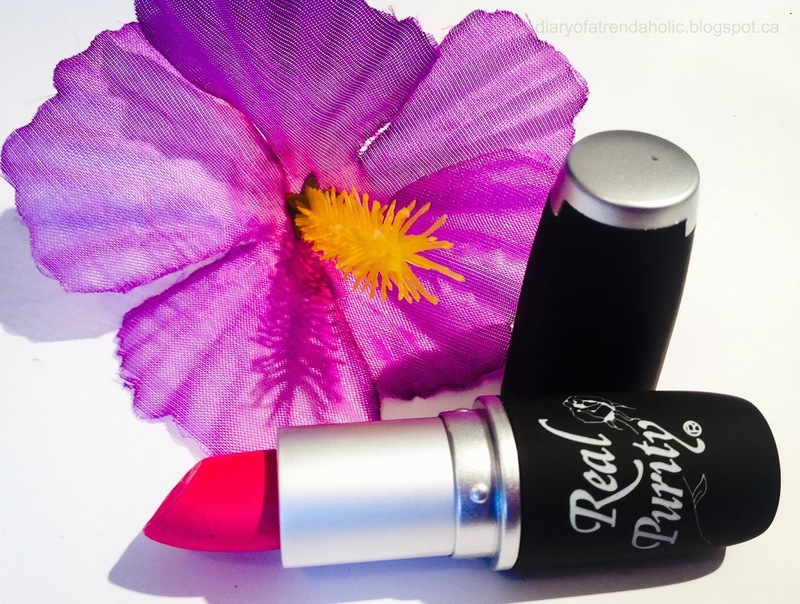 The lipsticks by Real Purity are designed to "plump the lips and be a powerful antioxidant." 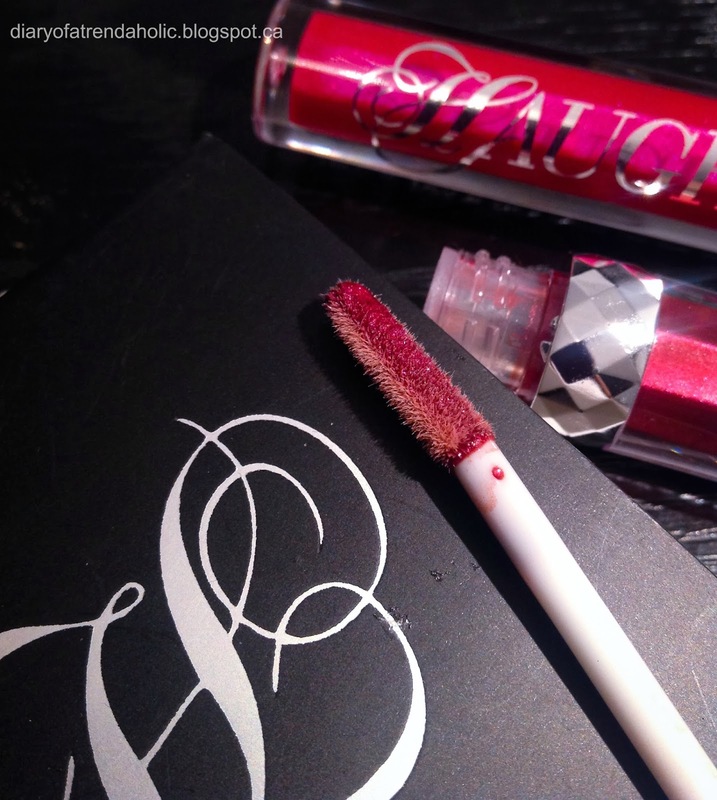 The lipstick is also non-drying, feels comfortable on the lips and is not prone to feathering. This is a great medium pink hue for a wide range of skin tones and the packaging is simple yet chic. I also like that the formula does not stain, it glides on easy and once removed my lips feel smooth and slightly moisturized. This winter I have been loving essential oils for skin care so today I have another review on some natural oils for use on the face and body. 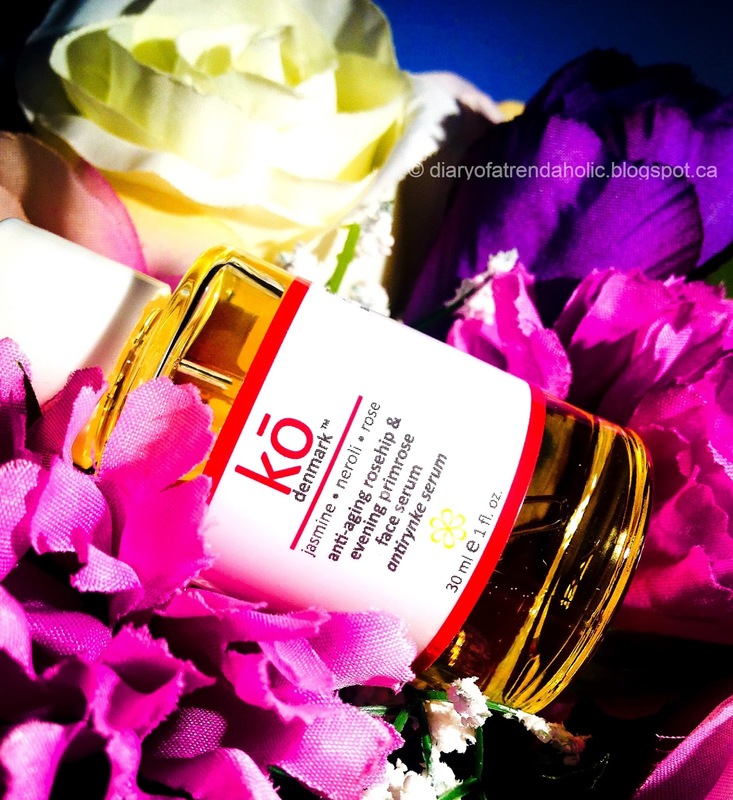 Ko Denmark is a skin care line that is founded by a woman named Henriette who utilized her knowledge of botanicals and her family’s ancient skin care secrets from their garden in Denmark to create some wonderful products. 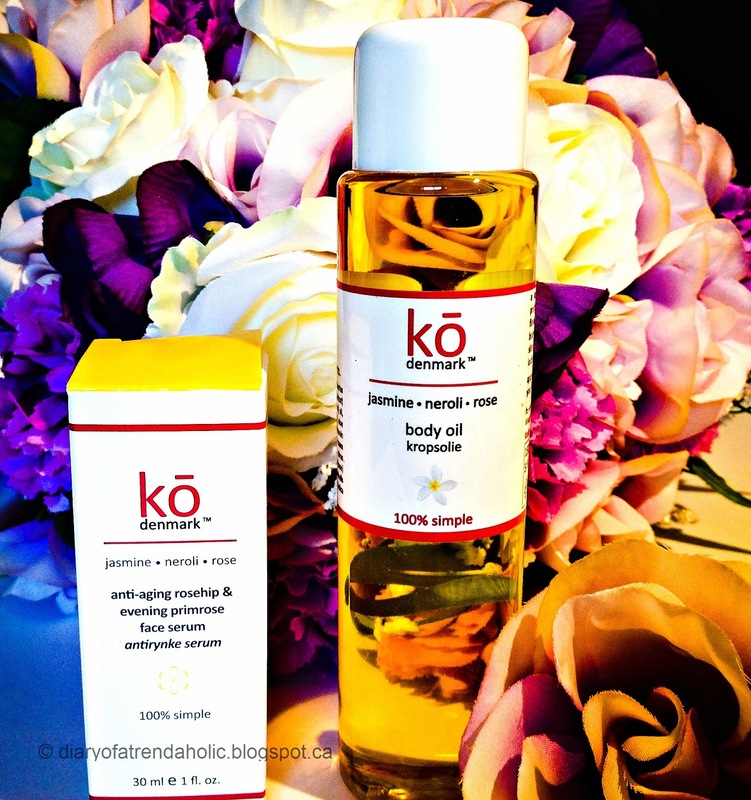 The oil can be applied to clean, damp skin to lock in “the body’s natural moisture.” It can even be used in the shower before you step out or as an indulgent massage oil! 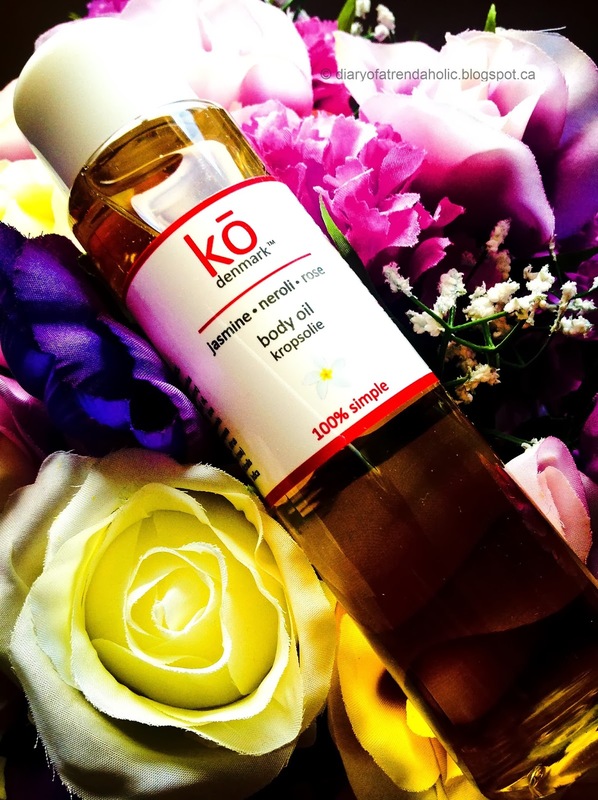 This oil contains: sunflower oil, apricot oil, sweet almond oil, jojoba oil, aloe, vitamin E, olive oil, rose, rosemary and neem. I always read the labels of products I put in or on my body and if there are minimal amounts of quality additives it can mean the difference between purchasing a product or leaving it on the shelf. I like this oil because unlike many drugstore moisturizers it actually contains beneficial components instead of synthetics. After taking a warm shower the oil feels luxuriously moisturizing and the scent has fresh, botanical aroma therapy benefits. After application I can feel trace amounts of oil on my skin until it dries. Because it is meant to be applied on damp skin the oil absorbs slowly due to the water barrier but feels pleasant and lasts long. I even add a few drops to my body lotions for more hydration. A nice deep tissue massage is also a wonderful way to allow the ingredients to seep in and relax tense muscles. The only thing I would recommend is adding a dispenser because pouring the oil from the wide bottle opening can get a bit slippery. The face oil contains many of the same natural ingredients as the body oil and has a pleasant, mildly fresh herbal scent. It has a medicine dropper applicator which is ideal for dispensing the oil and contains no parabens, mineral oil, perfume or animal ingredients. I primarily use this oil before bed because I don't use oil based products under my makeup. This oil provides instant soothing relief for dry skin. You only need 2-3 drops to hydrate the entire face. The more you use the more shine and product you will see on the skin but eventually the oil absorbs, dries and becomes less noticeable. It is also great for dry hands and moisturizing the cuticles. I use a tiny bit on my eyelashes before bed to help nourish the hair and promote growth. These essential oils do not clog pores or cause acne but rather nurtures the skin with vitamins. The moisture lasts all night and by morning my complexion looks healthy and dewy. I love discovering and using different brands of makeup, especially when the quality is great and I can achieve beautiful looks and get creative. 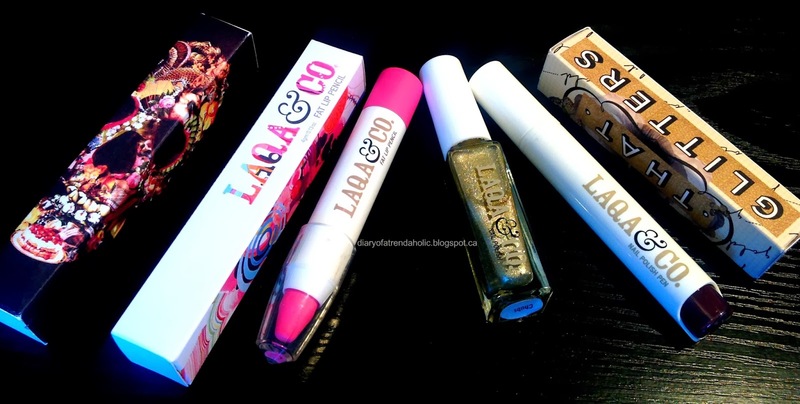 Today I have a review on some items by Haughty Cosmetics, a brand that offers everything from eye shadow, lip gloss, beauty tools and cute gift sets. 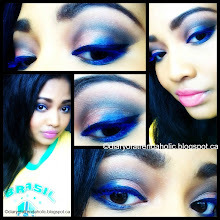 I have quite a bit of eye shadow but when I first touched the smooth velvety texture of these shadows I was impressed! 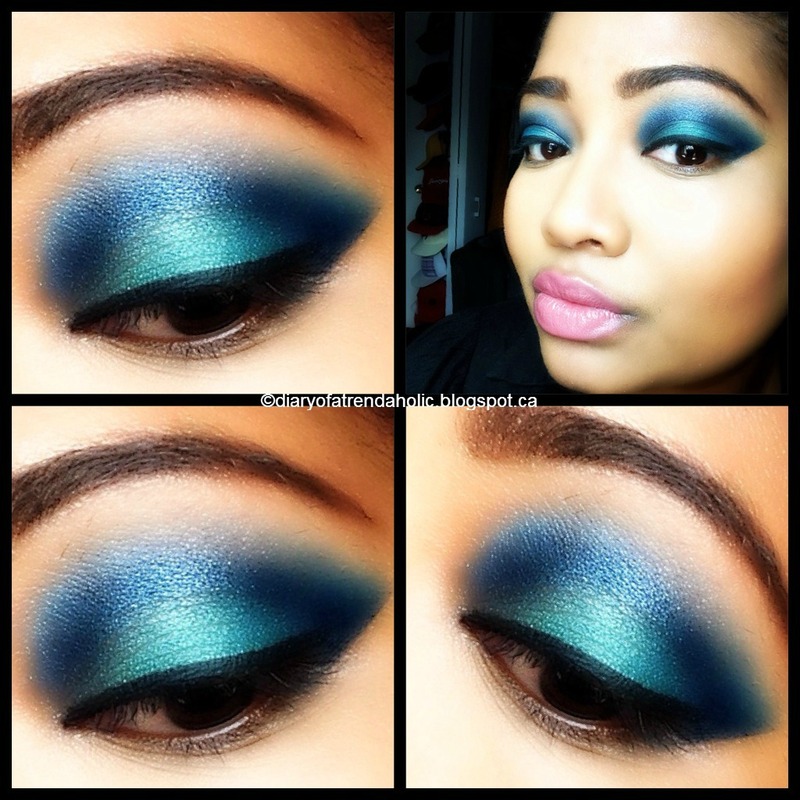 They are highly pigmented and the quality is wonderful. They are also made with vitamin E and are paraben free. 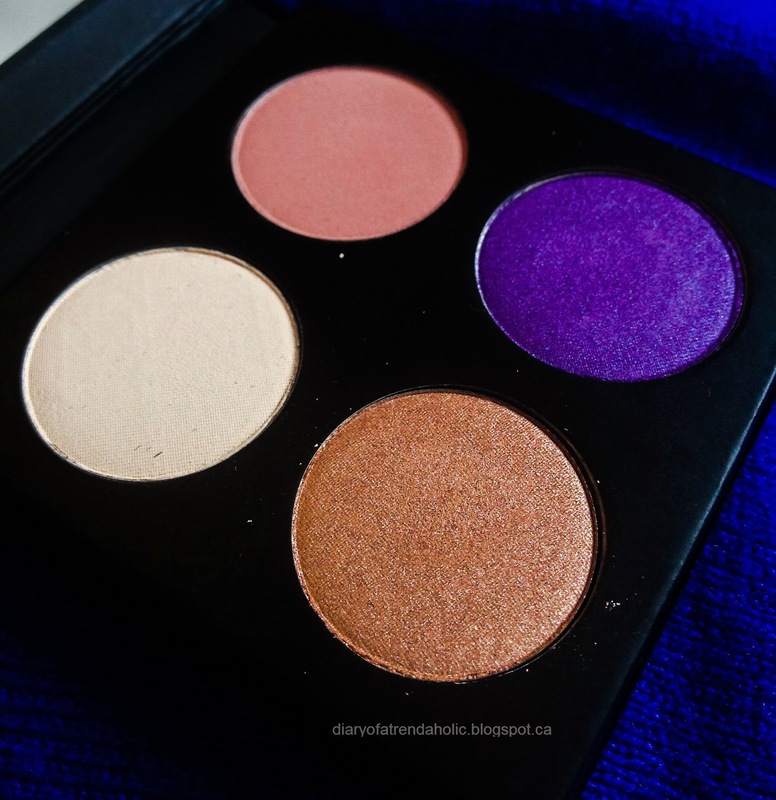 The quads come in pre-designed palettes and you can choose from a variety of color combinations that are suited to different skin tones and eye colors. You also have the option of making your own custom palettes. 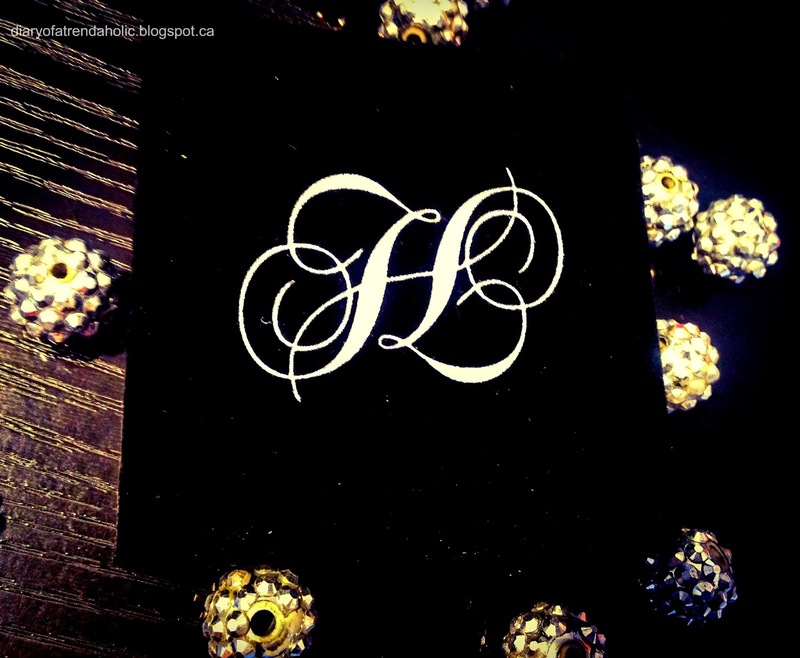 The 4 shadows come in an elegant, soft velvet box with the Haughty initial engraved on the top. It also has a large mirror on the inside and the cover is magnetized to protect the shadows. 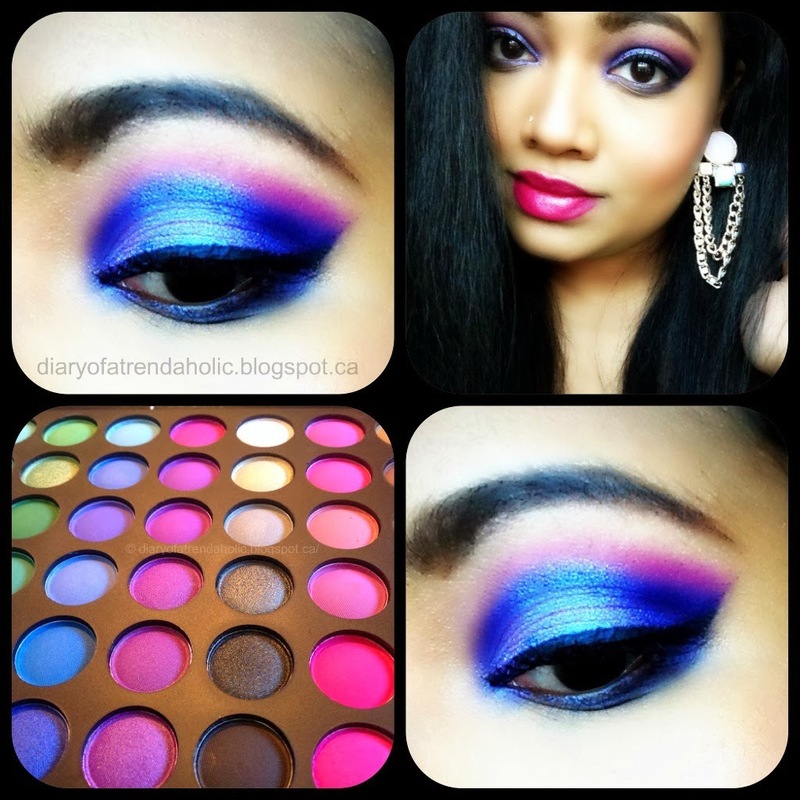 The palette I chose is called Treat, which is a pink and purple quad. I could not stay away from the vibrant purple and lovely gold. The color swatches on the website are a bit one dimensional and the shadows actually look better in person! These shades are easy to work with and they don’t crease, they are also long lasting and the palette is great for creating simple yet beautiful looks. 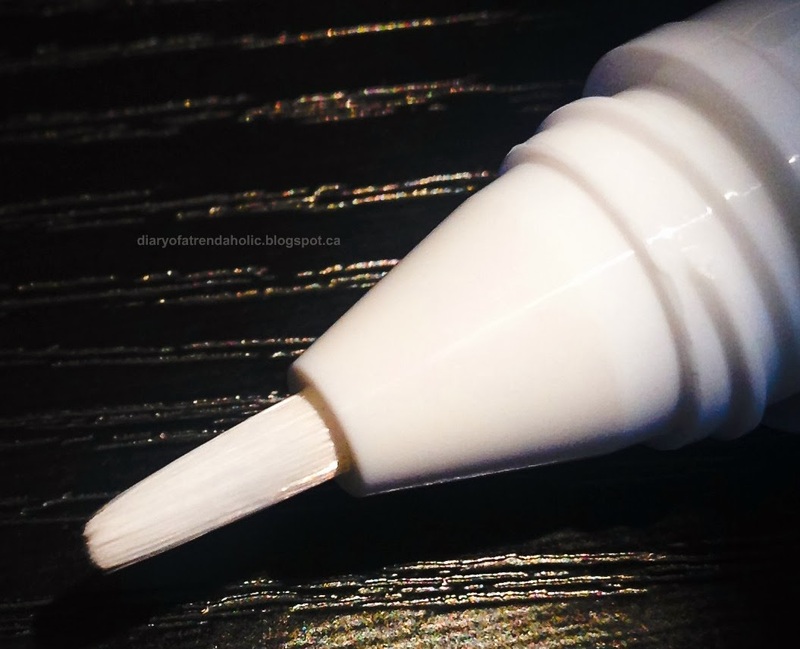 Although white is a color used less frequently, it works well as a base or as a matte brow highlight. It is also good for blending and fading out saturated colors. 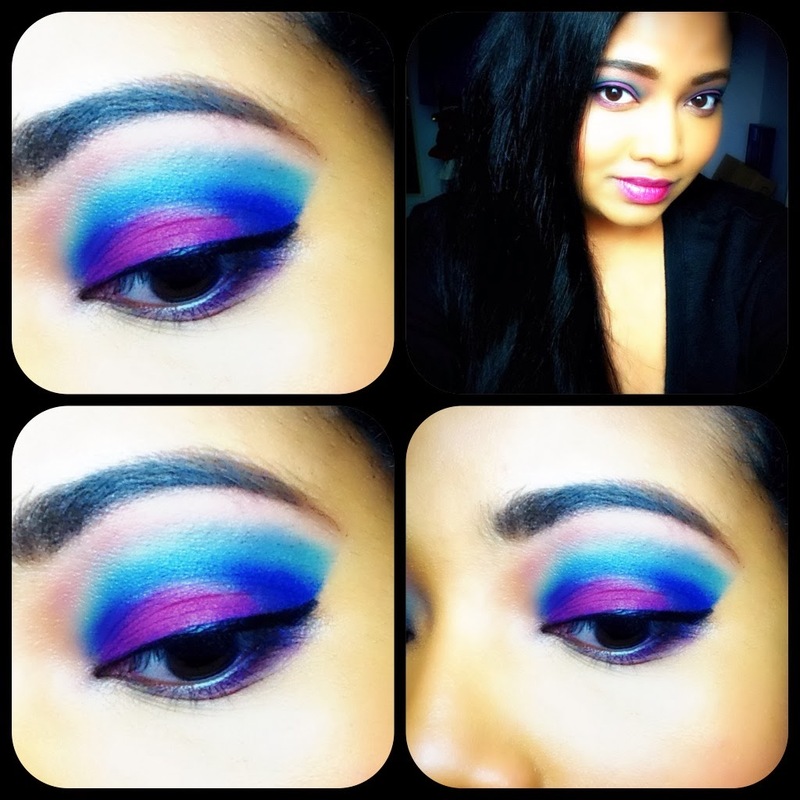 Here is a look I created using this palette. On my lips I am wearing the Haughty lip gloss in the color Pull it Together (which is reviewed below). 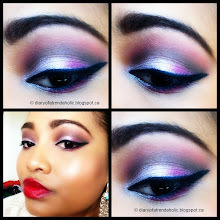 I used the light gold shade on my lids, and the purple in the crease. I darkened up the purple with a black shadow using the Increase your Advantage defining brush (also reviewed below). 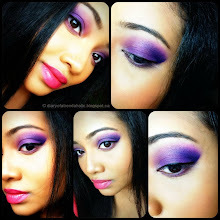 I used the light pink and the white as a brow highlight which faded the purple nicely. I think the colors look pretty blended together. I have quite a few makeup brushes but I have no idea why I didn't had this brush in my collection! The long bristles and pointed tapered shape is the perfect design for getting into the crease, defining it and applying color precisely where you need it. It works well for applying color to the outer v area to achieve a clean shape. It also doubles as a concealer brush, great for concealing spots, acne, discolorations and dabbing product under the eyes and in hard to reach areas. I also like that it is easy to clean, eye shadows wipe right off so I can use it with different colors without having to wash it in-between. 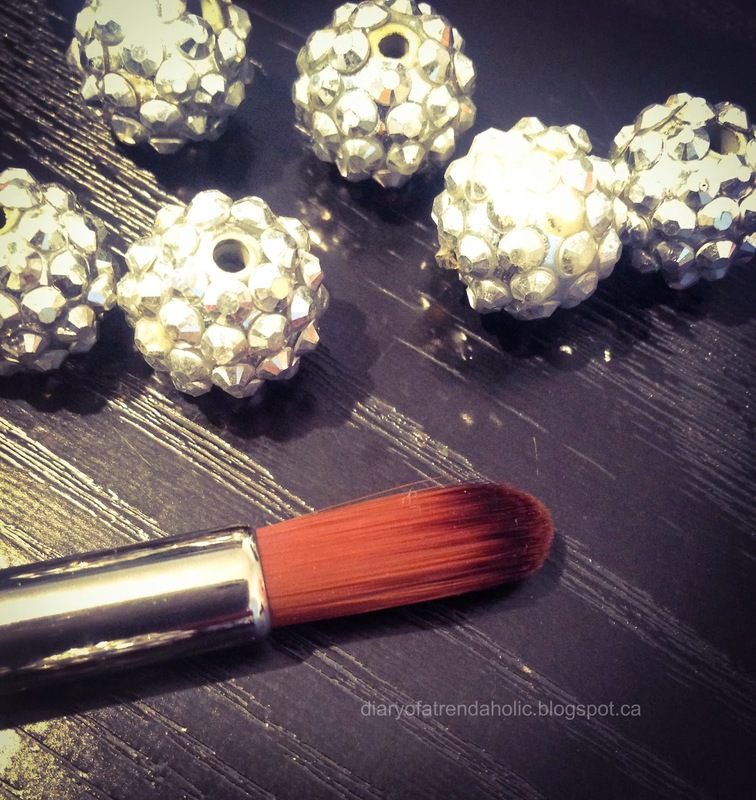 The bristles of this brush are very study and great for sharp, neat shadow application. Aside from the cute name this blush brush is the perfect size for sweeping blush onto the cheeks and placing it in the right spot without overdoing it. Since receiving it, there has been no shedding and the bristles are of medium softness and feel comfortable on the skin. I have been using this brush for weeks now and I like the quality of the bristles. 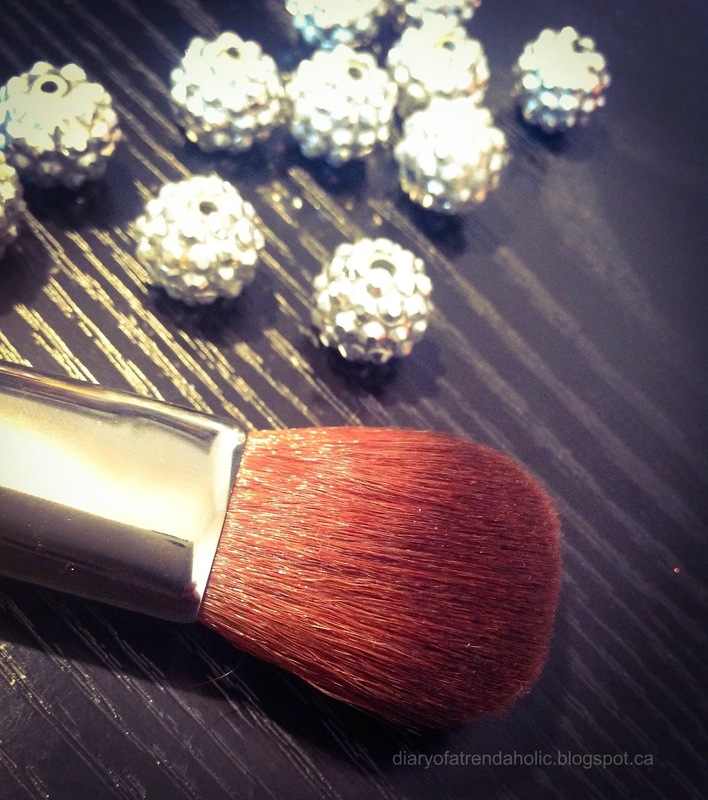 Blending a variety of blush textures is quite easy with this brush. The shape is unique in that the very end is slightly pointed and when turned sideways it is great for contouring the face and getting right under the cheekbones. 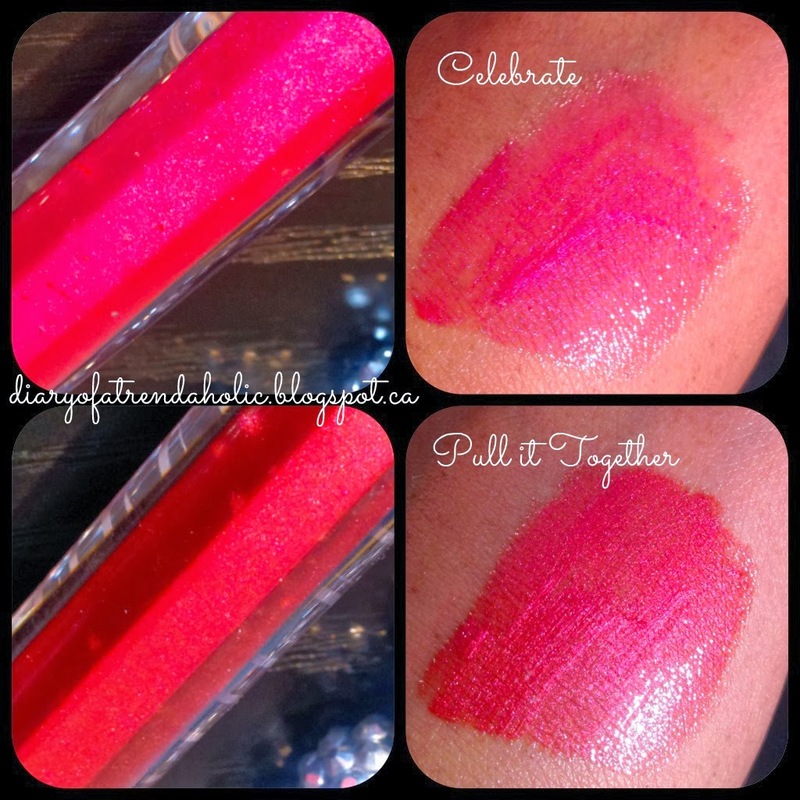 I found that Pull it Together provided more color while Celebrate had sheer coverage, so the glosses may have different color pay-off depending on the shade. They moisturize the lips with jojoba oil and the added benefit of vitamin E. I also think the packaging and the shades look quite glamorous. I love how shiny they are on the lips and the formula isn't too sticky. The long applicator wand is very flexible with the purpose of simplifying application. Haughty Cosmetics is also involved in a wonderful cause and 50% of all sales goes to fight domestic violence. 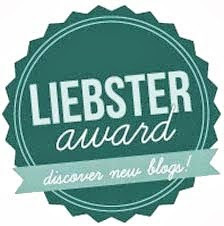 Recently I was selected by Influenster to be a part of the review process and launch for L’oreal’s new hair care line. I am very familiar with L’oreal's hair products; in fact my favorite shampoo is from the L’oreal Evercerme sulfate free line. 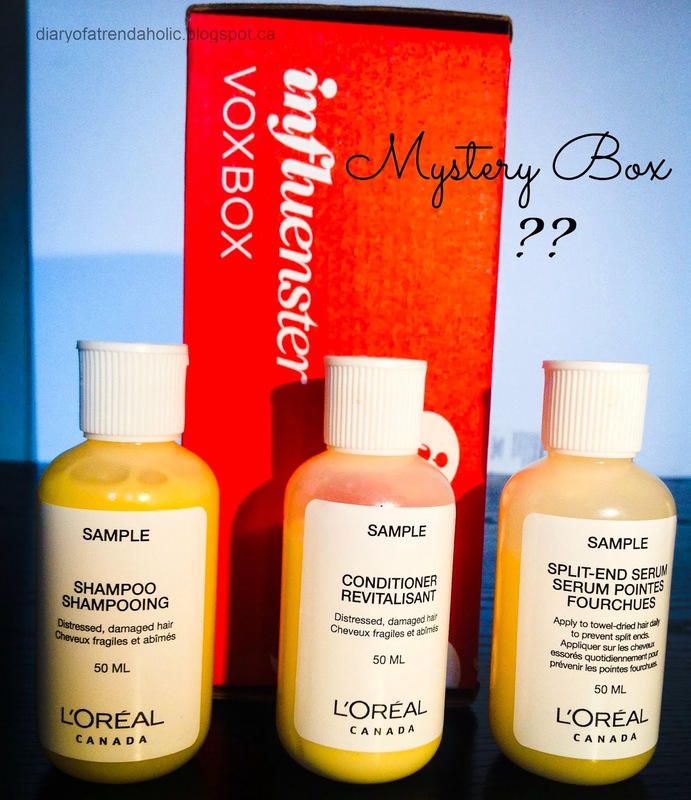 In week one I received a mystery box with sample bottles labelled shampoo, conditioner and split end serum but I was given no indication of what the line was called, or what the scents and ingredients were. 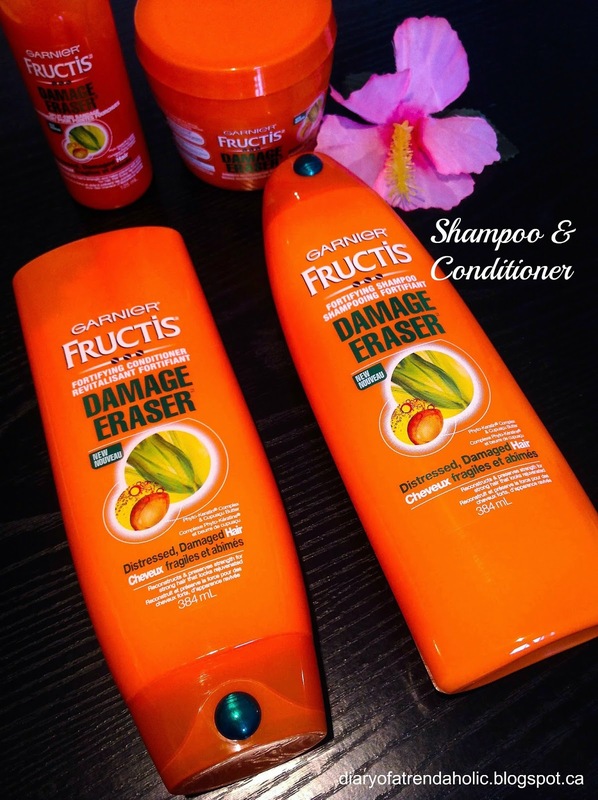 I tested the products for one week with the exception of the shampoo. In week two I received a box of full sized products and I finally got to see what I had been using! 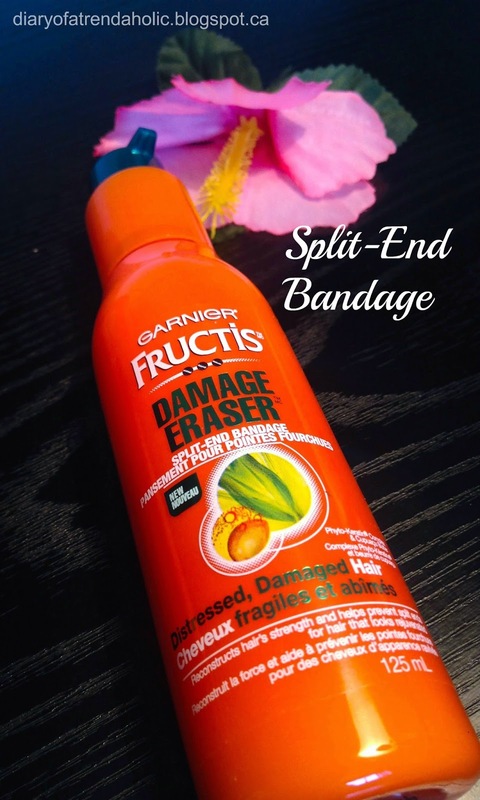 Garnier Fructis is a line I had used before with mixed results. When it comes to keeping my hair moisturized conditioners are essential. The first time I used this conditioner I liked the smell right away! Like most Garnier Fructis products it smells very fruity and sweet. 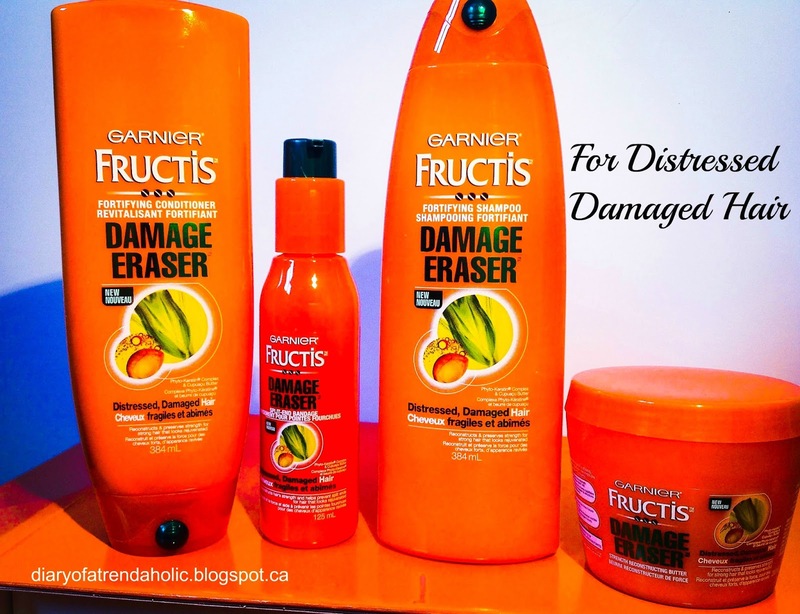 As I used the conditioner in the first week I knew it was a product that I would repurchase. 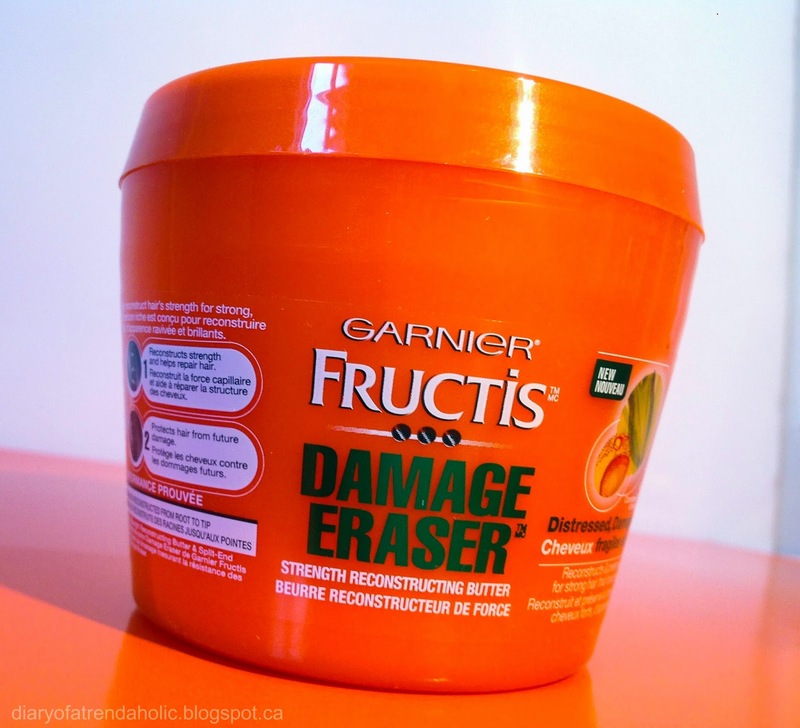 The thick creamy formula was great at coating my hair and detangling my curls. It left my hair feeling slippery soft and smooth. The conditioner is meant to “reconstruct and preserve strength, for hair that looks rejuvenated.” It contains phyto-keratin, botanical extracts and protein. The shampoo is also meant to reconstruct and preserve the strength of hair but because it contains sodium laureth sulfate and sodium lauryl sulfate I did not use it. (Sulfates are detergents found in most shampoos that can strip the hair’s natural oils and leave it dry and brittle). I do get split-ends no matter how healthy or moisturized my hair is. I have very long hair which means that my ends have been around for a while and they tend to be the hardest to maintain. Once the hair splits there is nothing that can repair it besides snipping off the end with professional shears. Using split end serums is a temporary fix that can bind the hair and improve its appearance. This treatment is also meant to help reduce split-ends, which is possible with the the right care. I applied the serum to damp hair after shampooing and conditioning. I like the smell of this product but the reduction and improvement of split ends cannot be measured in a mere week so I will have to keep at it. The serum was easy to disperse through my hair; it was lightweight and did not leave behind any residue. It also worked well with my other leave-in products and left my hair smelling wonderful! I love a good reconstructing treatment. This conditioner is a thick creamy hair butter that you are instructed to apply from root to tip for 3-5 minutes after shampooing. Applying conditioner to the roots is not usually necessary and for oily hair types conditioner should be applied from ear to ends. I don't think 3-5 mins is long enough for a conditioner to really penetrate and go to work so I decided to use it as a deep treatment and I left it on for a full 30 minutes instead. To me this was the strongest smelling product in the line. The scent is intensely, sweet and fruity which is fine with me because I don't mind highly scented products. It did make my hair feel soft and moisturized after use and I didn't have to use very much. It was also great for detangling. Overall my favorite thing about this line is the new addition of capuacu butter and the thick great smelling conditioners. In a previous post I reviewed the wonderful natural facial oils from Pelle Beauty. 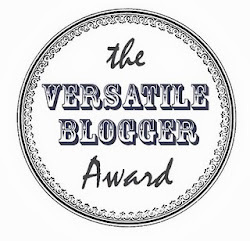 Today I am going to review their natural balms. 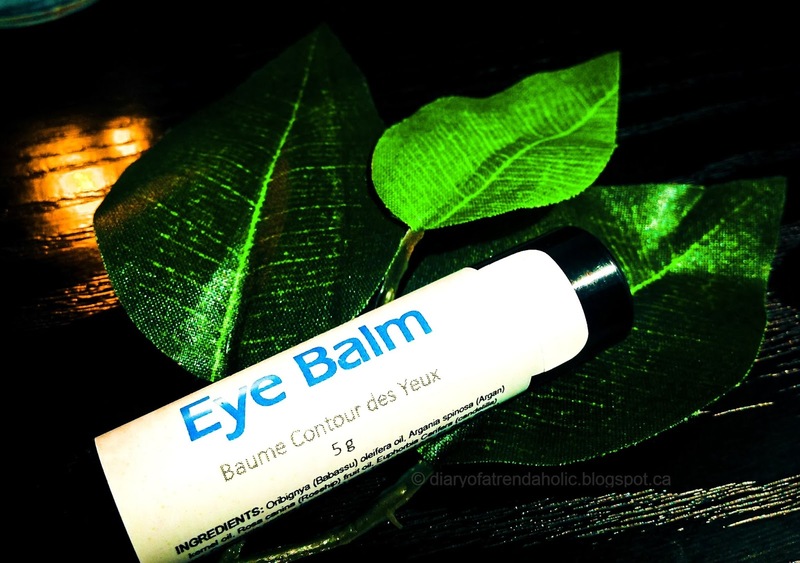 I have heard of all types of balms but I had never used an eye balm! I think the idea of putting an under eye treatment into an easy to use balm is ingenious! Unlike some eye creams that can dispense too little or too much, this balm keeps application tidy and the tube is ideal to toss in a bag and pack for travel. The formula is very easy to work with, it glides onto the skin and seems to melt in. The design also allows for controlled, precise application. To use the eye balm you can pat in on, or as I prefer, gently swipe it on directly from the tube. The ingredients provide long lasting hydration you can see and feel! My eyes definitely look more refreshed and healthy when I slather this balm on the night before. The skin under the eye area is very sensitive so fragrances and other chemicals found in face moisturizers and other products can have adverse effects. This products is natural and specifically made for use under the eyes to keep skin moisturized. 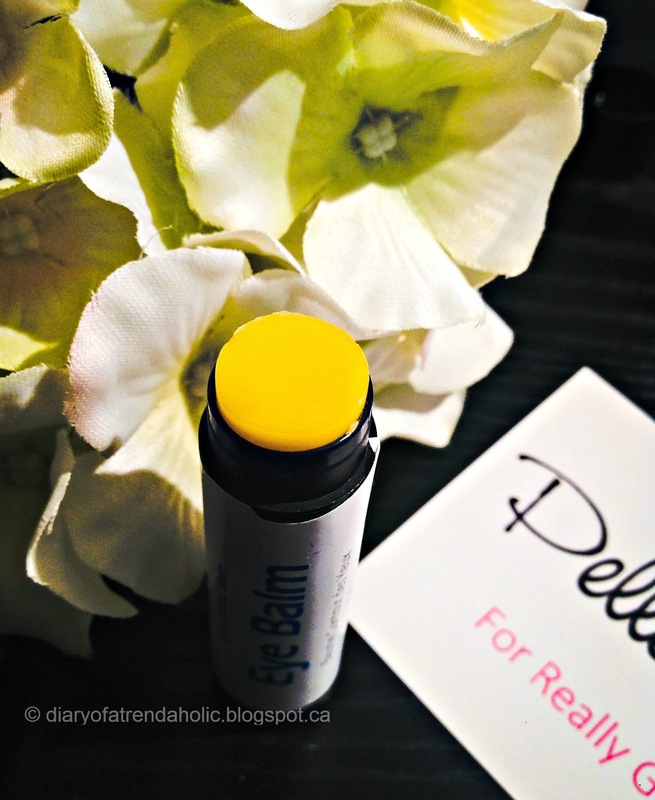 I find myself reaching for this balm very often and it is definitely one of my new favorite eye treatments. 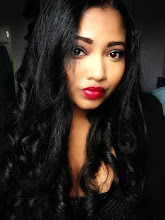 I love to wear lipstick, anything from nudes to bright bold shades so I try to take good care of my lips. I stash lip balms in almost every room in my house so that I am always ready to relieve dry lips and keep them supple. I have the balms in the scents: mint-which is scented with natural mint leaf, vanilla- scented with vanilla fruit extract and mocha-scented from coffea Arabica oil. The mint balm does have a true mint scent without the menthol tingle but the mocha and vanilla balms smell predominantly of raw cocoa butter. Because the balms are natural, they are unique in texture. They are quite dense and thick and even though they contain natural oils they are non-greasy. When rubbed onto the lips the butters and oils tend to warm on contact and become easier to spread. Once applied they have a nice texture and leave my lips feeling soft. Each batch is hand mixed and hand poured! 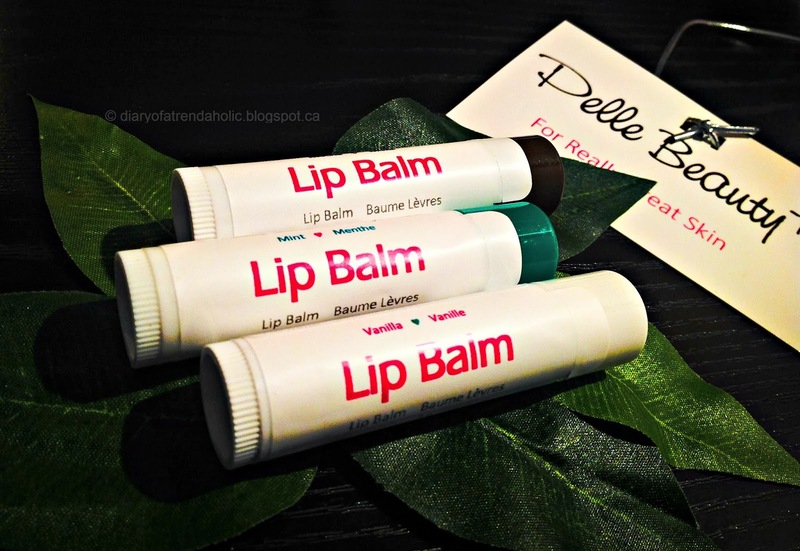 For those who have adverse reactions to certain lip products the balms contain no artificial flavors or synthetics so they do not irritate the face and skin. 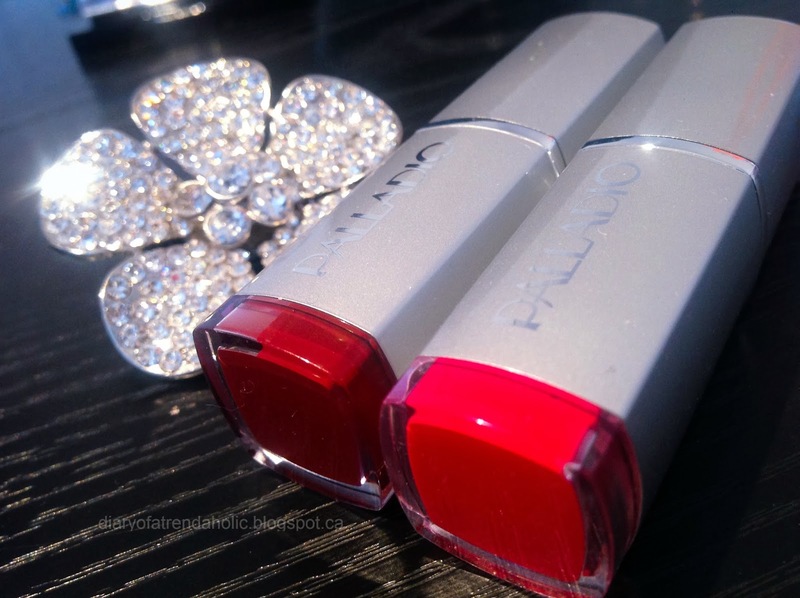 Today I have a review on cosmetics by Palladio Beauty. These were the first items I have tried from this line, although it was not the first time I heard of them. My first impression was that the quality of the makeup is good, especially for products that are so affordable and that are infused with herbal benefits and vitamins. The first item I am going to review is this pretty herbal mosaic powder in the color Pink Truffle. 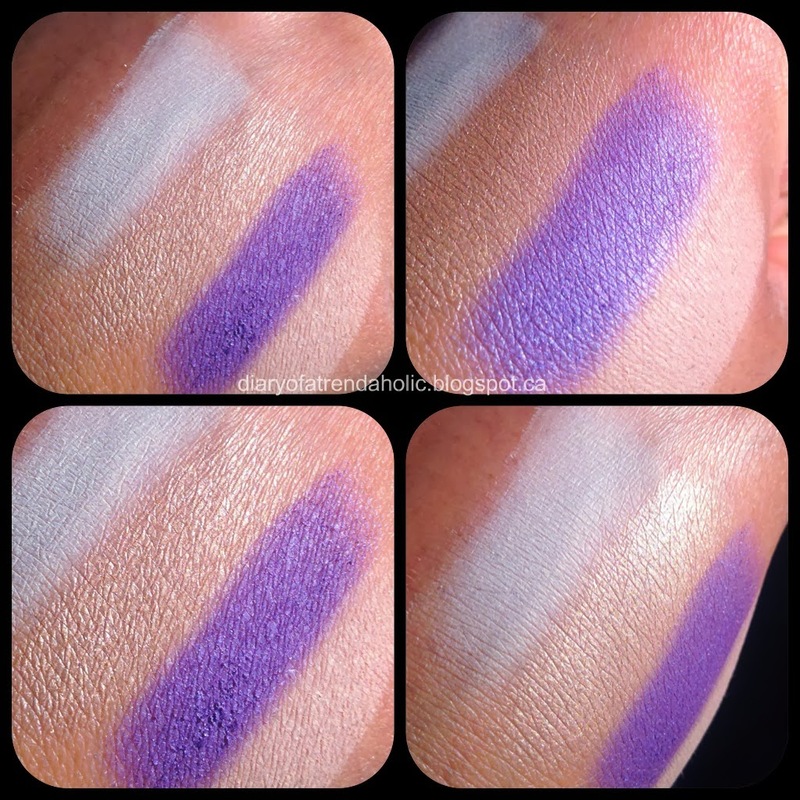 The combination of colors caught my eye right away and the powder also comes in 3 other color variations. My favorite thing about this product is that it is multi-functional. The darker shades can be used as a bronzer, all of the shades can be used as eye shadow and the lighter shimmery shades can be used as a highlight for the face. As a blush blending all the colors together creates a unique shade and a beautiful effect. The texture is smooth and easy to apply. 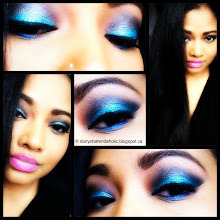 This eye shadow palette contains everything you need to create a beautiful look. 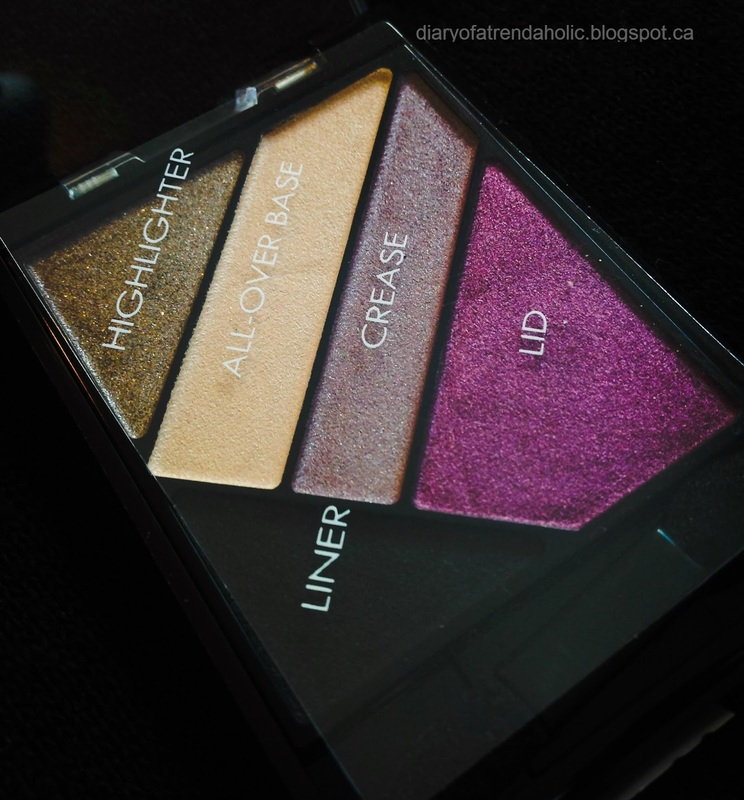 The shadows are also labelled to show you which colors can be used where making it easy for beginners. 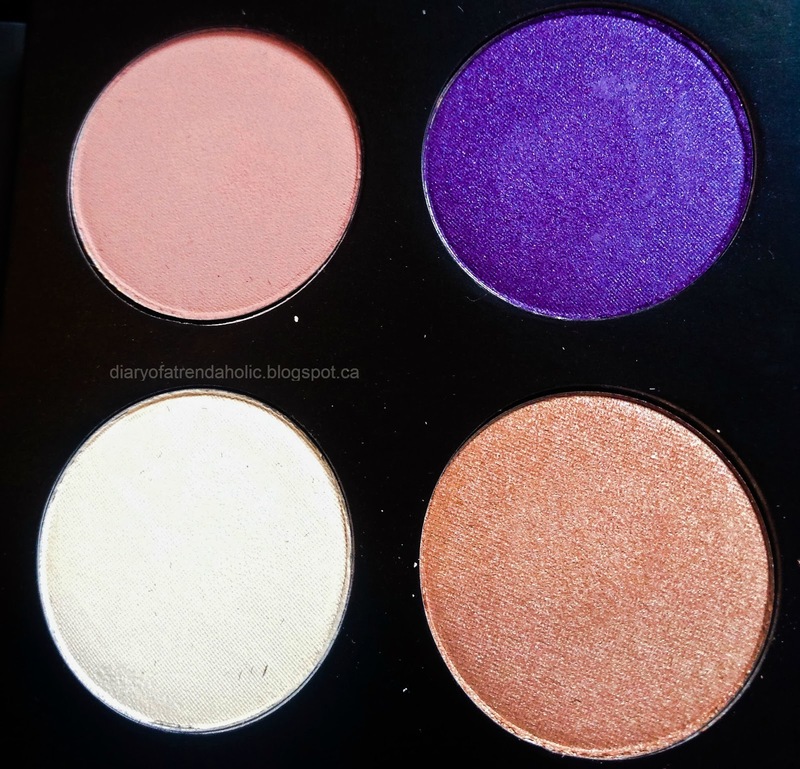 This particular palette with the purple lid color is called Boudoir chic and there are also 7 other wonderfully matched palettes to choose from. 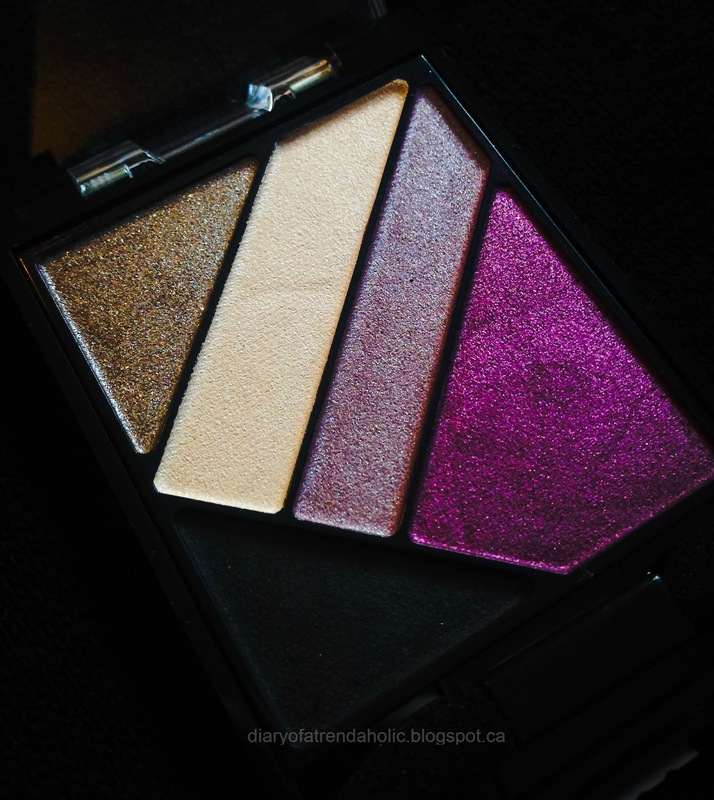 I like palettes like this because they are compact, complete and convenient while on the go. These shadows have good pigmentation and the colors match well. I also like the shimmer finish especially the beautiful highlight. 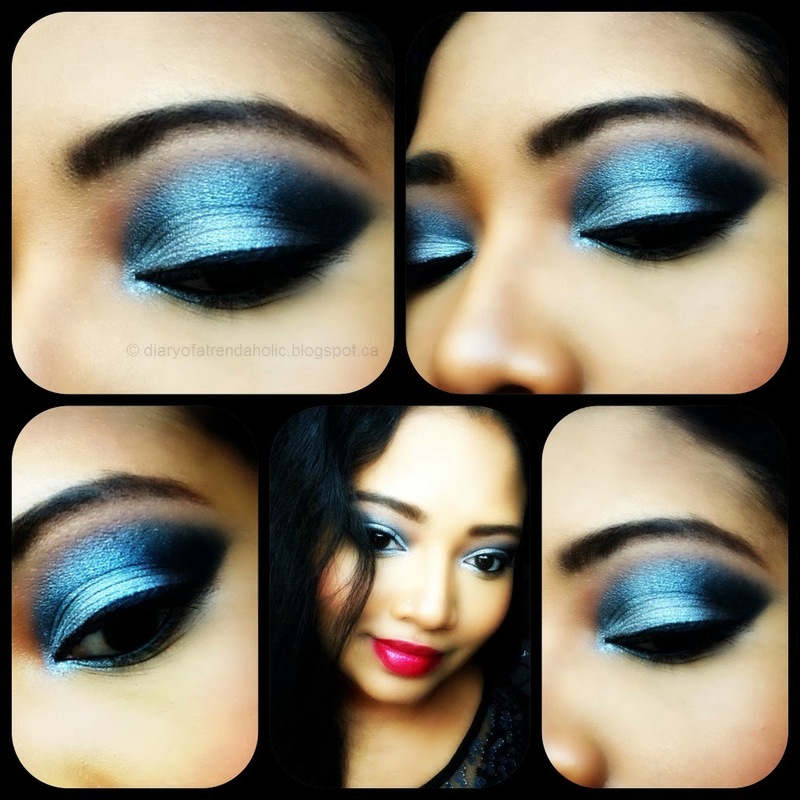 This is great for creating a lovely smokey look or it can be toned down without the black for something a bit lighter, it is a palette that can easily take you from day to night. 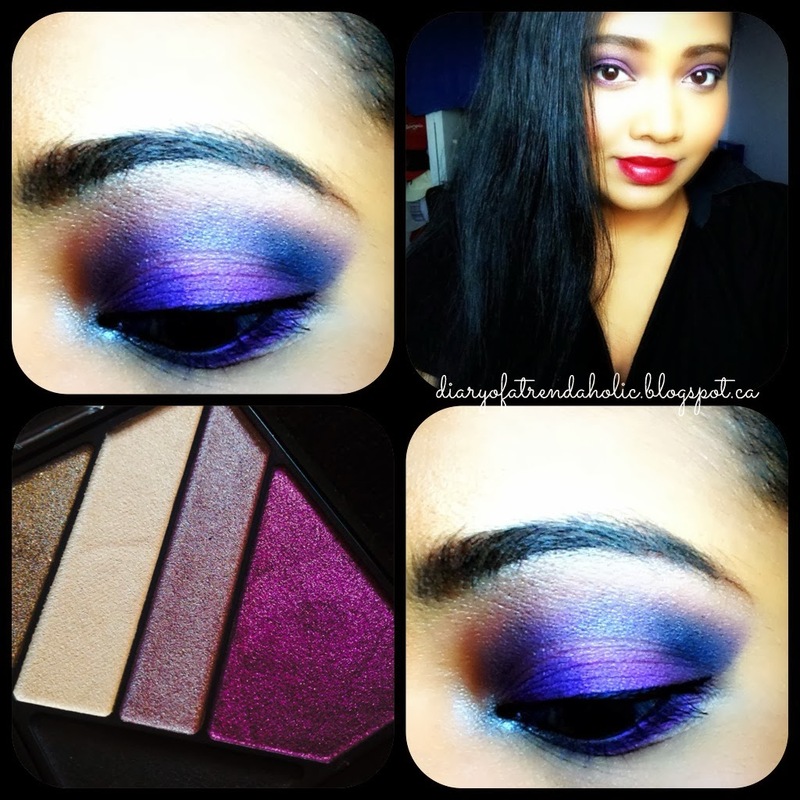 Here is a smokey purple look I created with this palette. 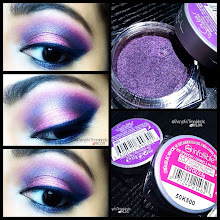 To get this look I started out with the base shade on my lids and then used a lot of the purple pigment by patting it on heavily in layers. I also found that the color labeled "crease" was pretty light so I used the black or "liner" shade over the crease shade to darken it. 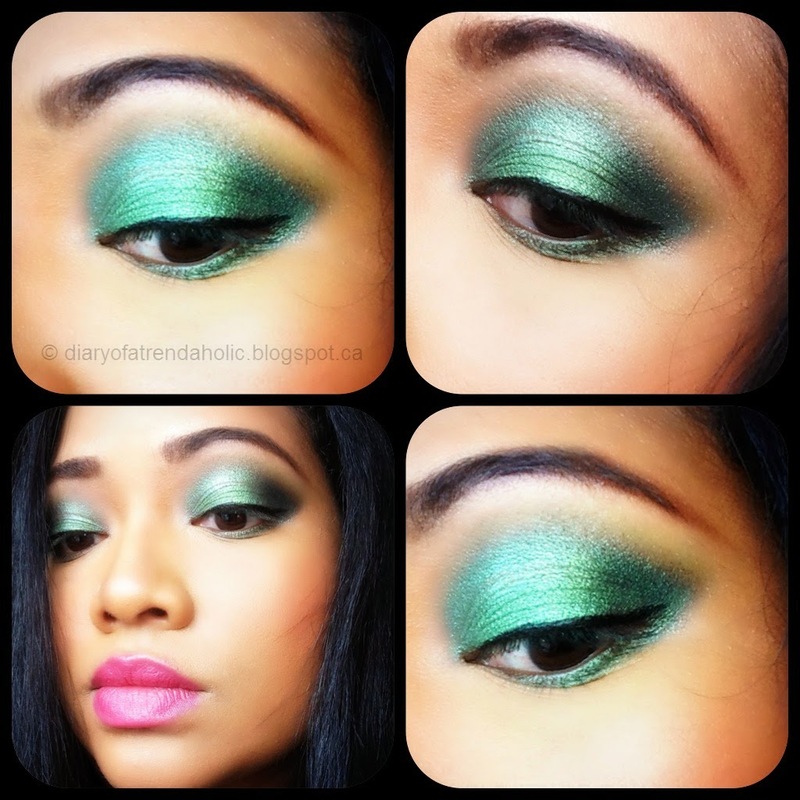 The highlight shade is a bit dark and quite subtle, I used it under my brows. 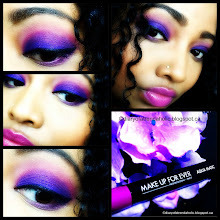 I used the purple lid color to line my bottom lash line instead of the black. Overall I think by blending the shades together the effect is quite nice. Even though the palette appeared to have a shimmer finish initially, once you dig past the top layer the shadows are quite matte which I don't mind. 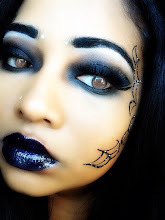 In this photo I am also wearing the Palladio lipstick in the color Juniper which is reviewed below. You all know that I am a lip product fanatic so I had to try the lipsticks from this line. They come in 31 beautiful shades and the texture is creamy initially but tends to become less creamy and more matte as you wear it. 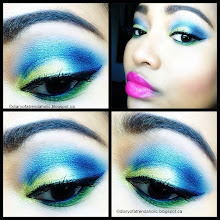 The shades are highly pigmented, full coverage and great quality. 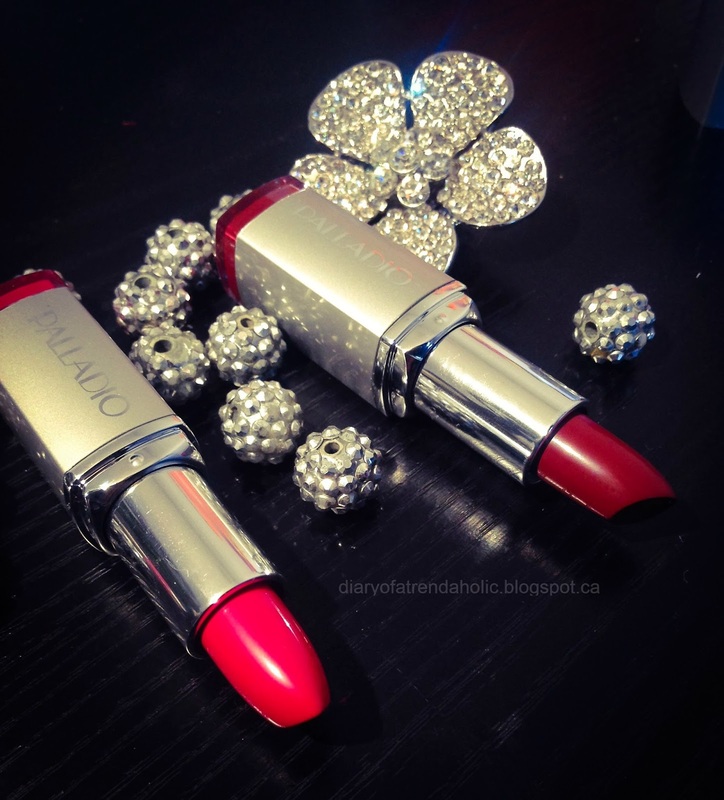 The lipsticks contain coconut oil, aloe and vitamin C and E to help protect against free radical damage. 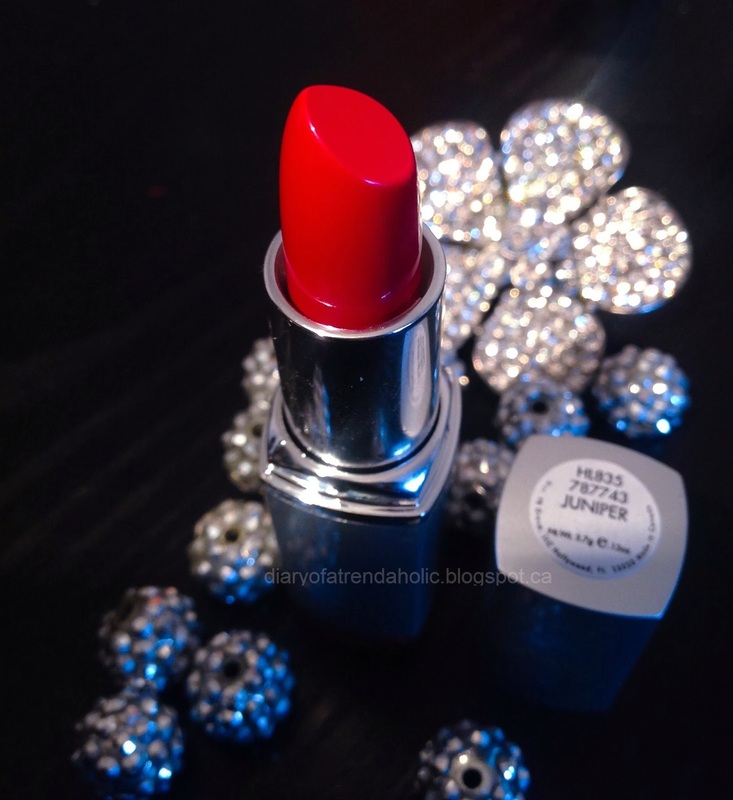 This shade is a gorgeous bold red and it reminds me of a shade Taylor Swift would wear. It is also the color I chose to wear on Valentine's Day this year. 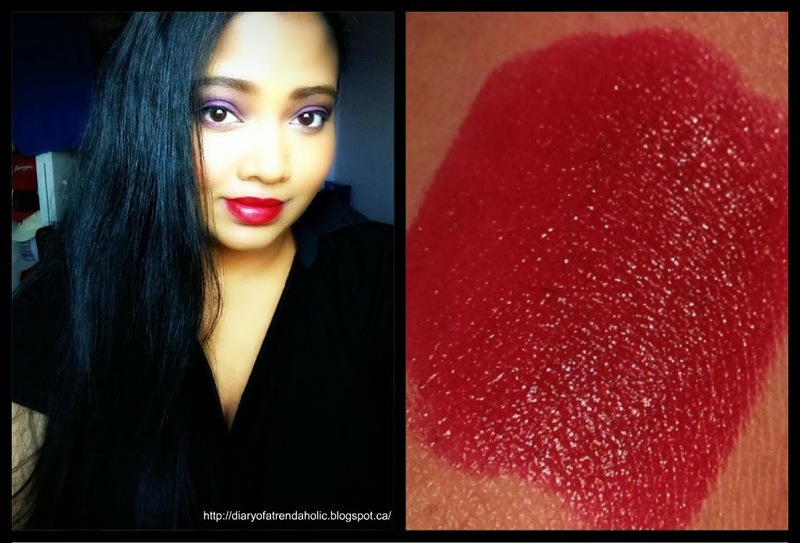 This shade is a dark rich wine color great for all seasons and complimentary to many skin tones.